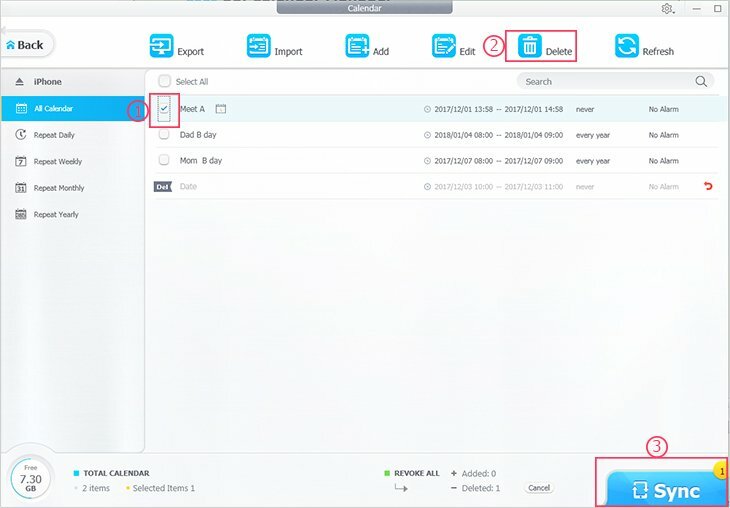 Flexibly manage iOS data, yet completely secured. 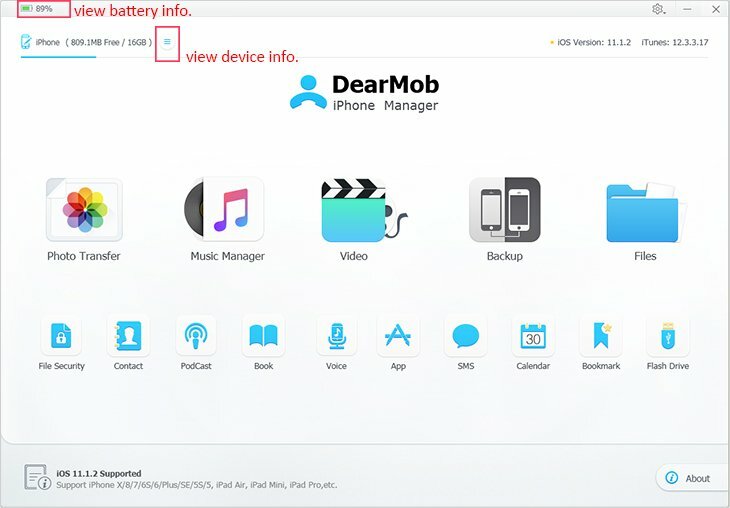 1 Click below button to download a setup file of DearMob iPhone Manager. 2 Double click the downloaded setup file to install it. 3 Click "Yes" to proceed installation when the UAC window pops up. 4 When installation window shows up, click "INSTALL". ● Tips: You can change installation folder and choose whether to "Create a desktop shortcut" or "Add to Quick Launch" by clicking "Custom Installation". 5 Wait a few seconds to complete installation, you can click Launch to start managing your iOS data. ● Tips: You can buy full version to remove trial version limits. 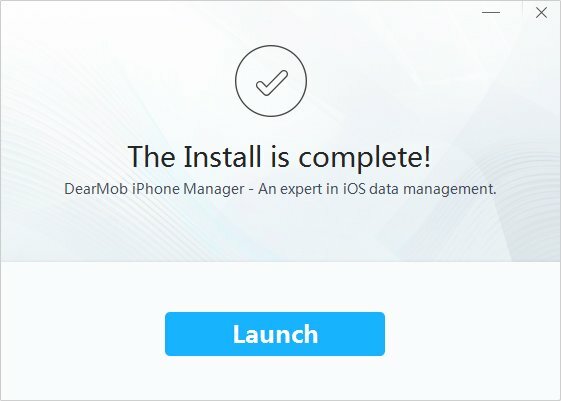 Follow below steps to register DearMob iPhone Manager. 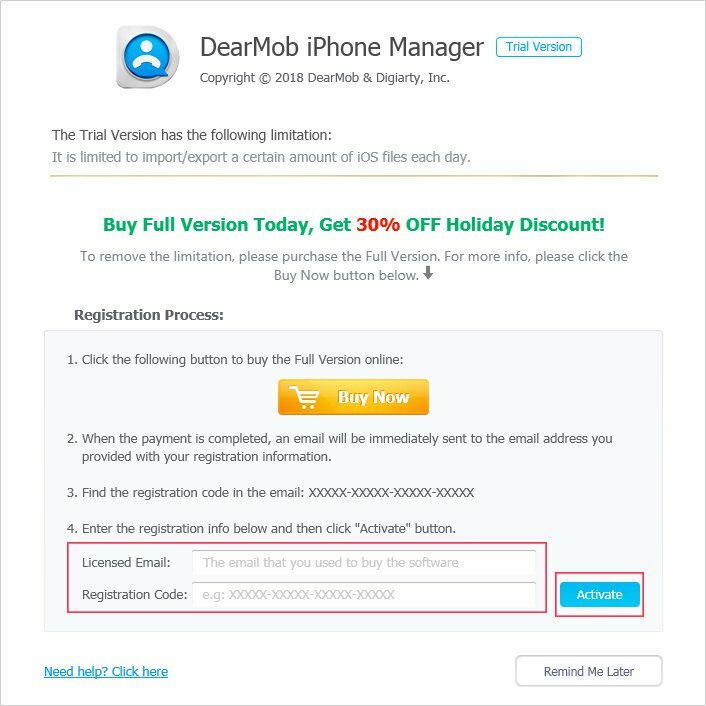 1 Get registration code of DearMob iPhone Manager. 2 Click below button on main interface. 3 Enter your Licensed Email and Registration Code in below empty place, and click "Active". 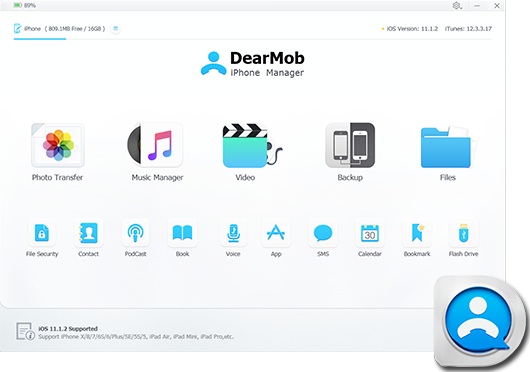 Then you can use all the features of DearMob iPhone Manager. 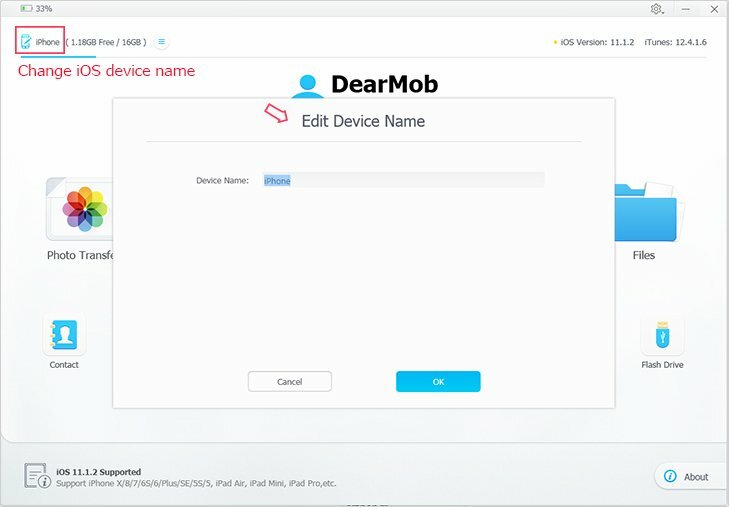 From the interface, you will know what DearMob iPhone Manager can do for you mainly. 1 Photo Transfer. Supported formats: .jpg, .jpeg, .png, .gif, .bmp and .tiff, etc. 2 Music Manager. Support almost all audios thanks to a built-in audio converter of DearMob iPhone Manager. 3 Video. It can convert any video to Apple-friendly MP4. 4 BackUp. 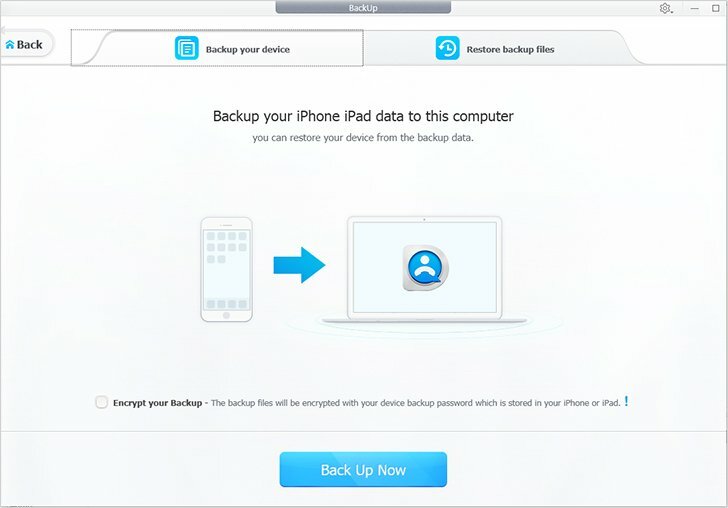 One-click to backup & restore all iOS data. 5 File. 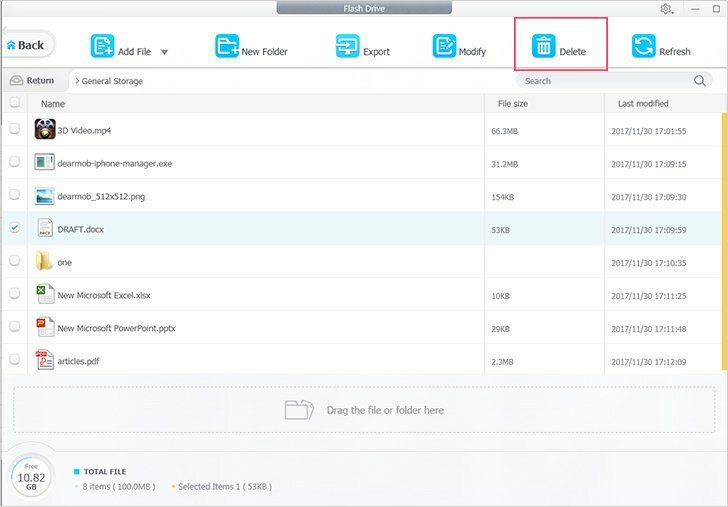 Manage files of iOS devices. 6 Data Security. Encrypt & decrypt your data/files. 7 Contact. 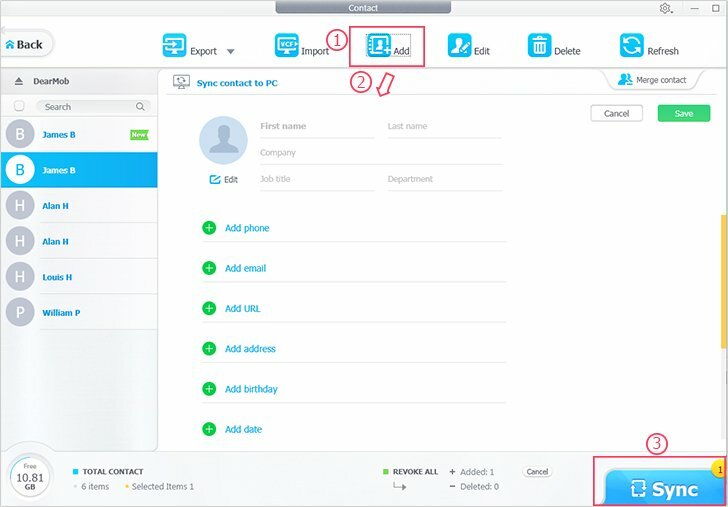 Export, import, add new, modify your contacts. 8 PodCast. Manage PodCast and iTunes U. 9 Book. Transfer & convert iBooks. 10 Voice. 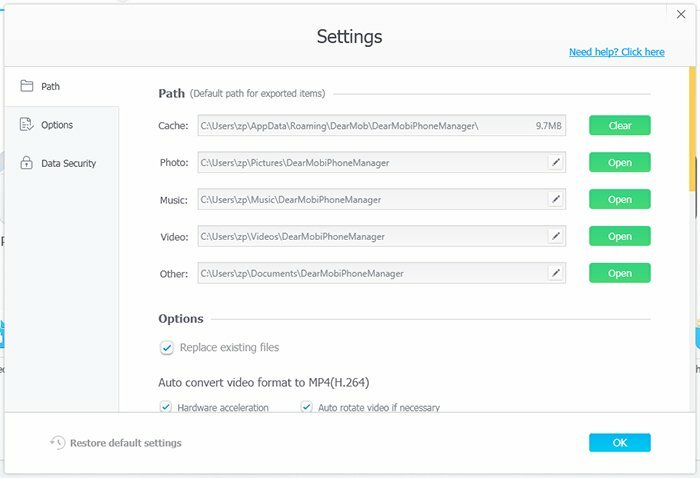 Manage Ringtone and Voice Memos. 11 App. 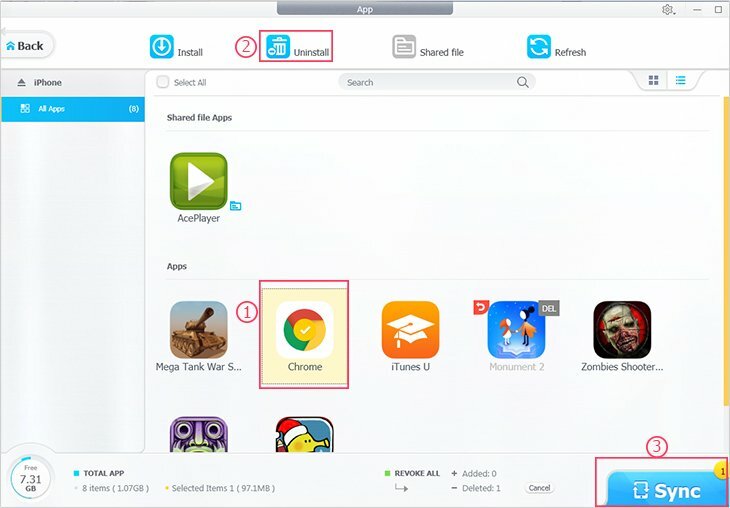 Install & uninstall Apps, manage App files. 12 SMS. 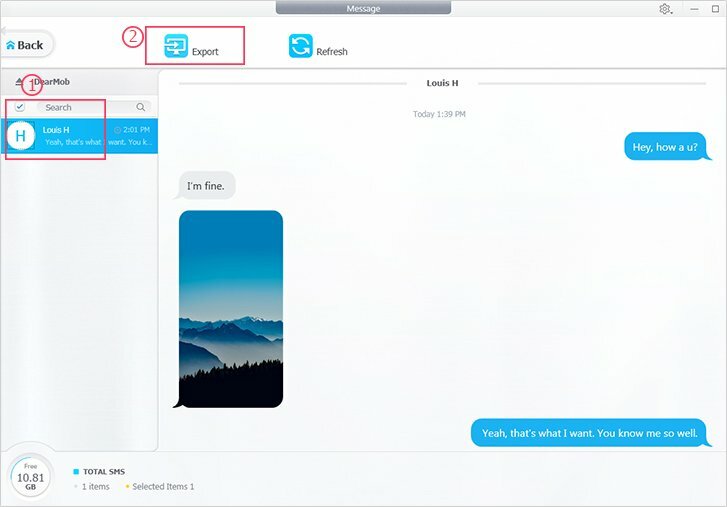 Backup your messages to local computer. 13 Calendar. 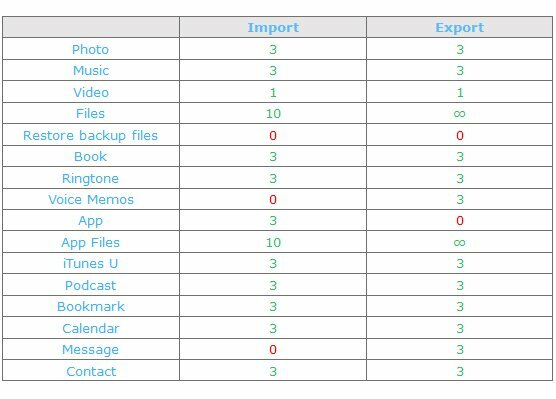 Backup, add, import calendar. 14 Bookmark. Transfer, add, edit Bookmarks. 15 Flash Drive. Mount your iPhone as a potable USB drive. 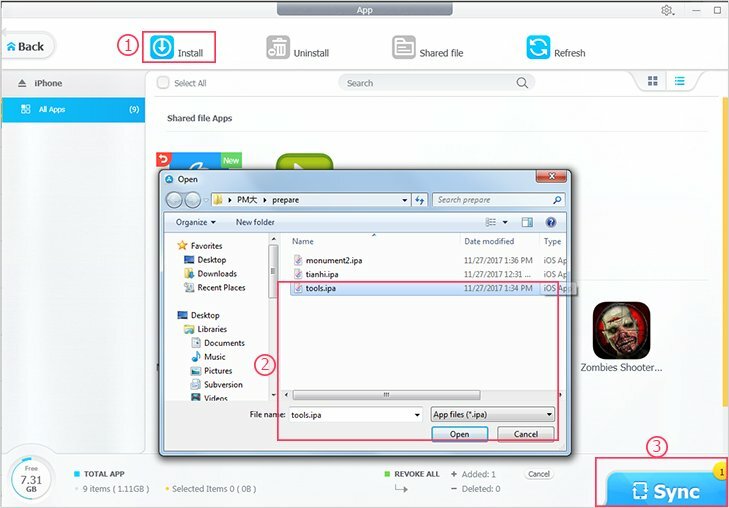 ● Tips 1: Connect your iPhone/iPad/iPod with computer, you can see your device info. 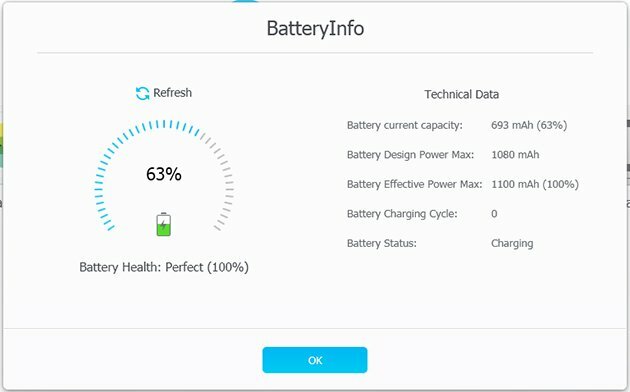 ● Tips 2: Also, you can click the "Battery" icon to check your iPhone battery health & tech data. ● Tips 3: And it is easy to change your iOS device name, just to click the devide icon. 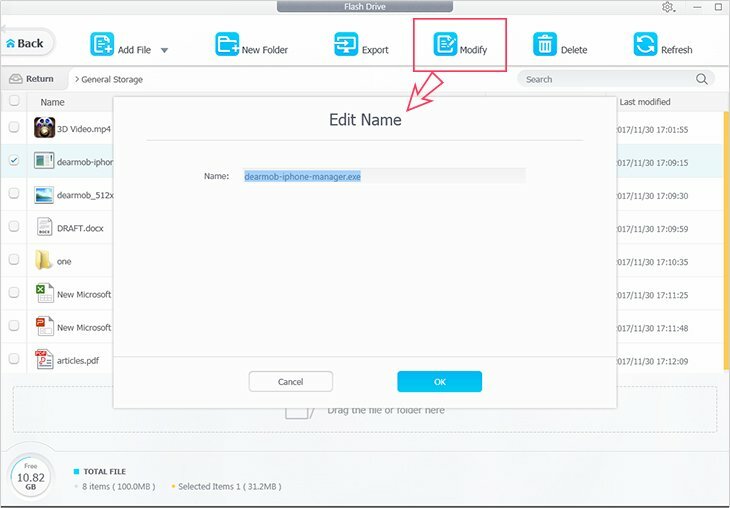 The name would automatically sync to your iPhone/iPad once you clicked OK.
1 Customize the local path to store transferred files. 2 Choose below options for your iPhone management. 3 Set password for your data security & file encryption. 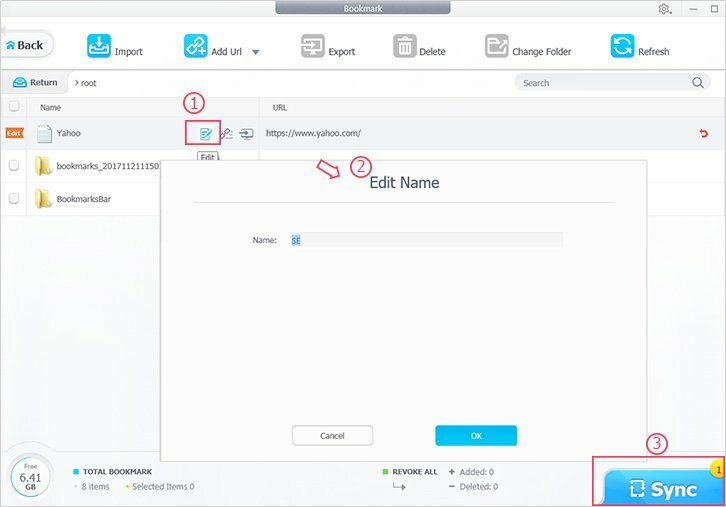 1 Connect your iPhone/iPad to computer, click "Photo Transfer" icon on the main interface. 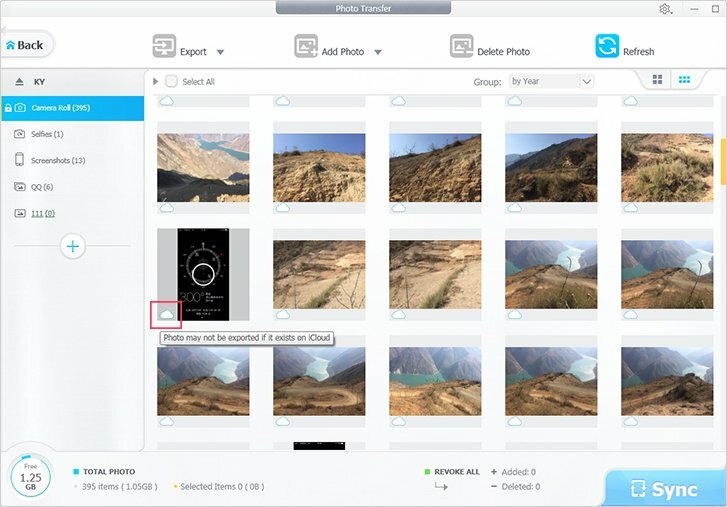 2 Choose some or all photos and click "Export", then you can find the photos on your computer local drive. ● Tips 1: You can group photos by Year/Month/Day or neither, and also view photos in large or small column. ● Tips 2: Click "Refresh" to get real-time data of your iPhone iPad. 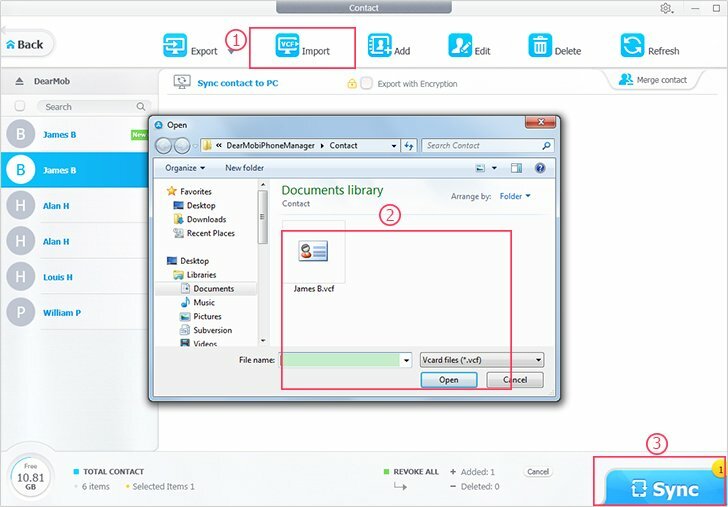 ● Tips 3: There is an option for you to encrypt the file while exporting, just tick "Export with Encryption". 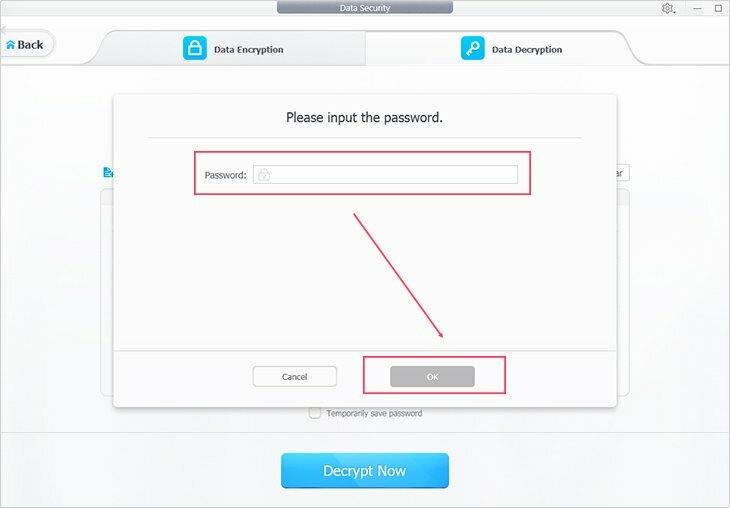 You can decrypt the file anytime, here is the guide. Please Note: HEIC picture may not be viewed on Windows PC, you can export it as JPG. Please Note 2: Live photos can be exported as a JPG/HEIC picture along with a MOV video. Please Note 3: The cloud icon shows that the photo is in iCloud or other cloud software. If you can't export this photo, please download it to your iOS device first, and then follow the steps above for transferring. 1 Click "＋" to create a new album first. You can edit the name of new album at will. 2 Then choose the new Album and click "Add Photo" or "Add Folder". ● Tips 1: If you add some wrong photo, click the red curve icon beside each newly added photo to undo it. Or you can click "Cancel" to revoke all added photos. 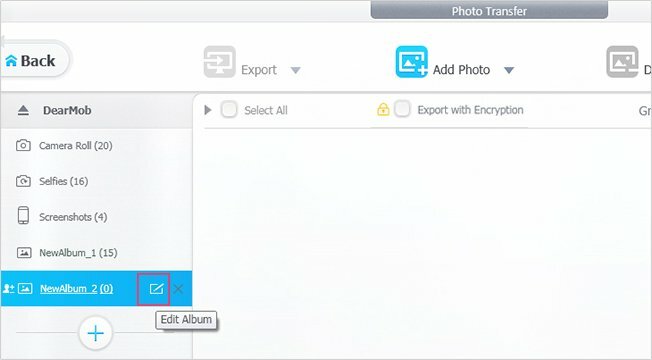 3 Click "Sync" to import photos to your iPhone iPad. Please Note: you can only add photos to an unlocked album. Photos cannot be added to locked album like Camera Roll or Screenshot. ● Tips 2: You are allowed to edit the name of created album. 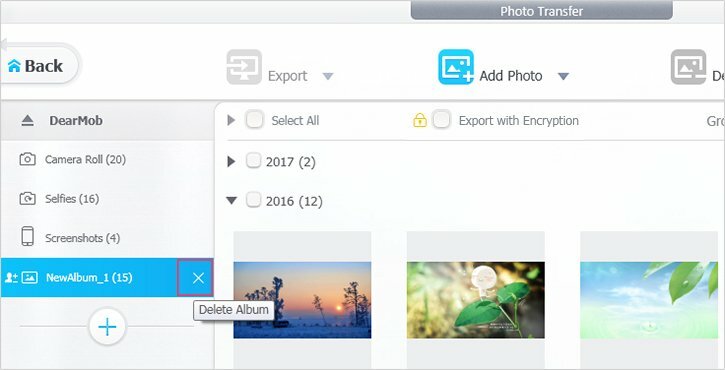 1 Select photos that you want to delete in an album. 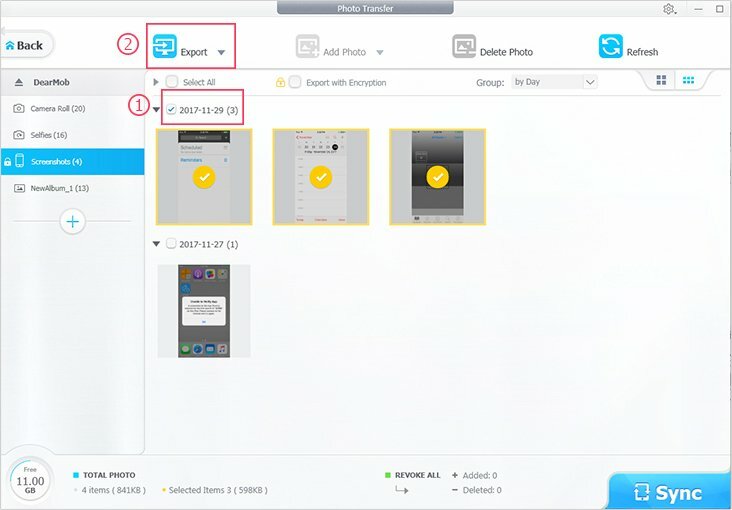 2 Click "Delete Photo" to erase these photos from your iDevice. 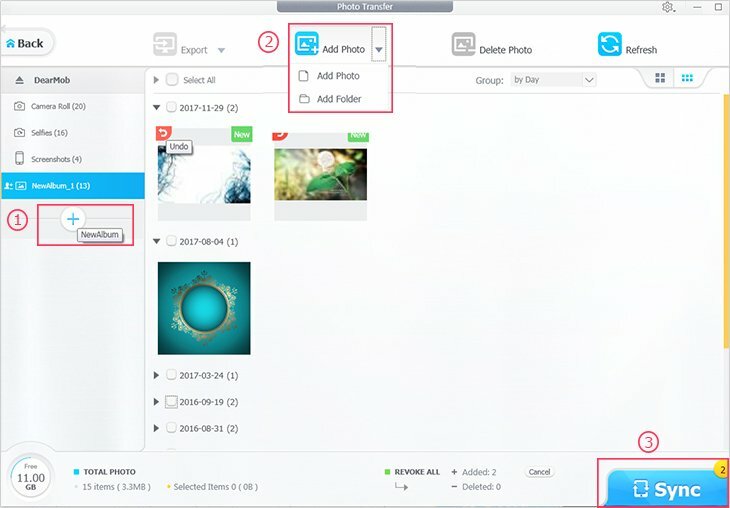 ● Tips: There is an Undo option provided for you in case you delete some photo/album by mistake. Also, you can revoke all deletions by click "Cancel". 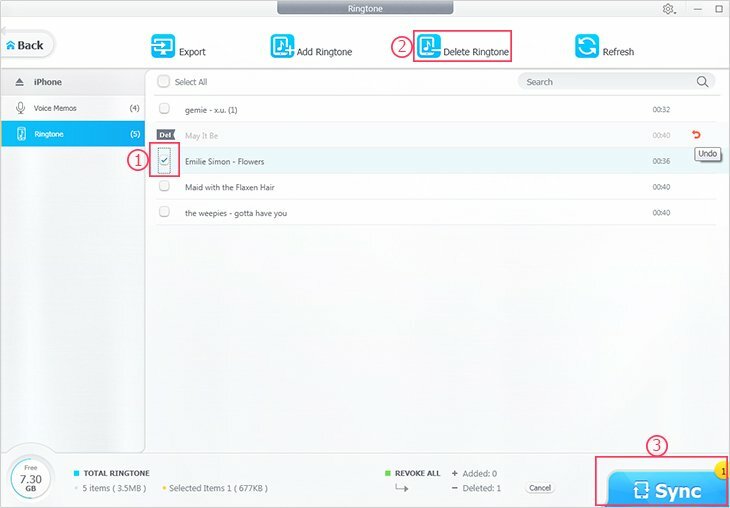 3 Click "Sync" to synchronize the deletion to iPhone iPad. If you want to delete album, you need to delete all the photos in it first. Then click the "╳" icon beside the album. 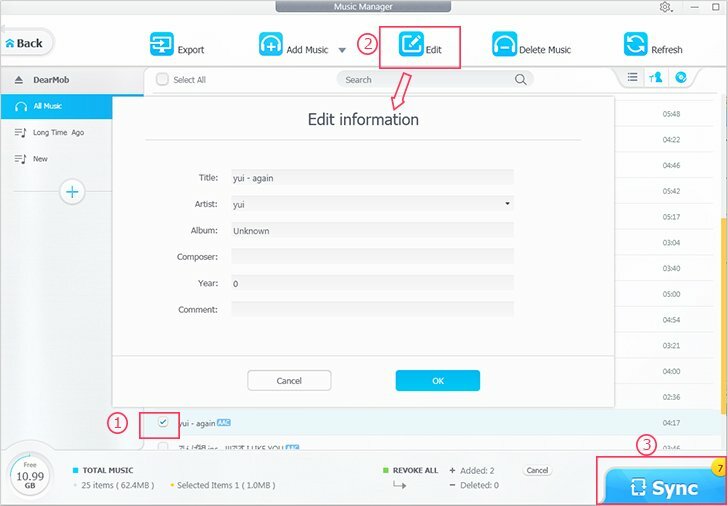 To export songs from iPhone iPad to computer requires only two steps. 1 Click "Music Manager" on the main interface to jump into music management window. 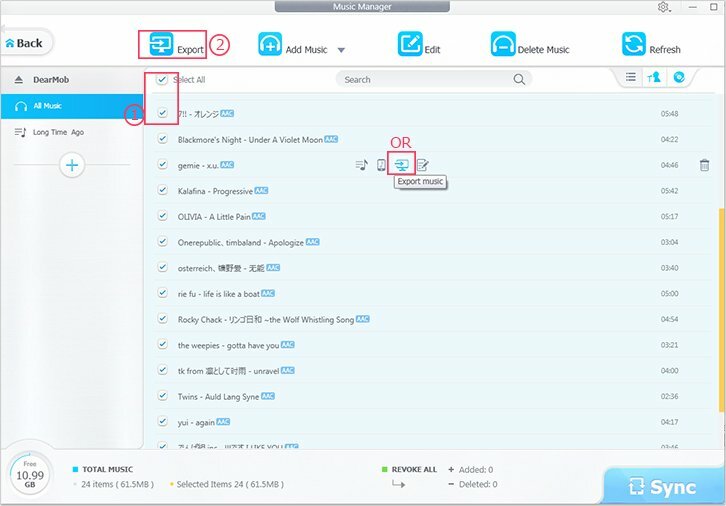 2 Select some songs, click "Export". Or you can click the export icon beside each song to export this one. Seconds later, you can find them on local computer folder. 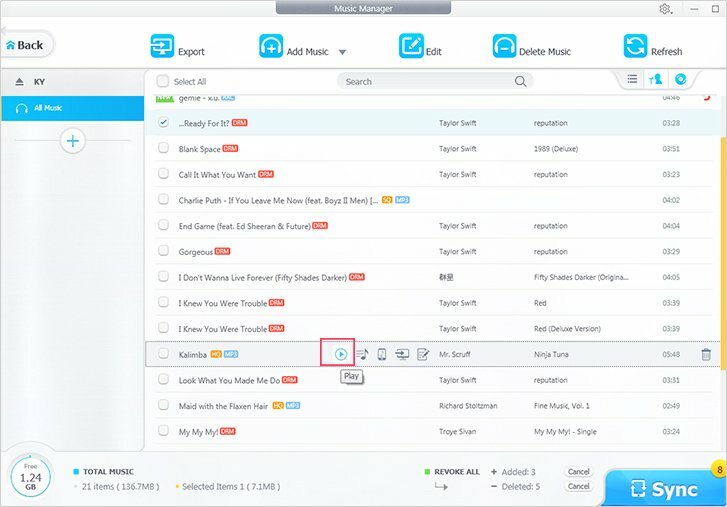 ● Tips 1: Music can be grouped by List, Artist or Album. 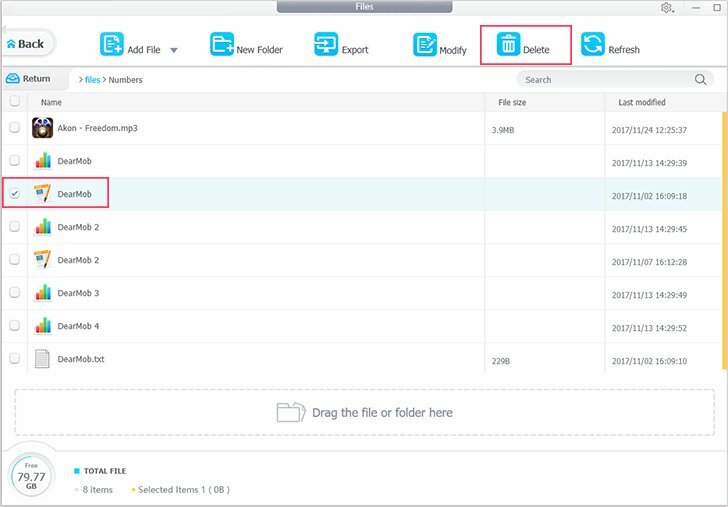 ● Tips 2: To get real-time files of your iOS device, you can click "Refresh". 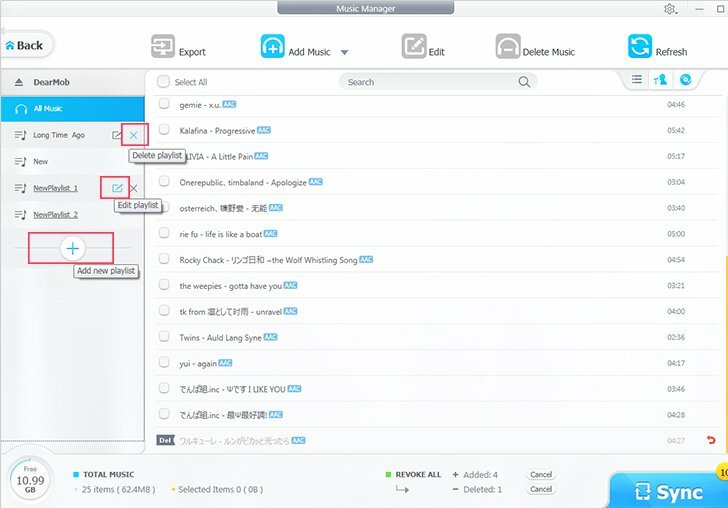 ● Tips 3: You are able to search music in case you may have many songs. ● Tips 4: You can listen to the music either in your iPhone, iPod, iPad, or computer. Please Note: DRM music can't be played, you need to decode it first when export to PC. 1 Click "Add Music" to choose local songs and click "Open". Or you can click "Add Folder" to import a whole folder songs. 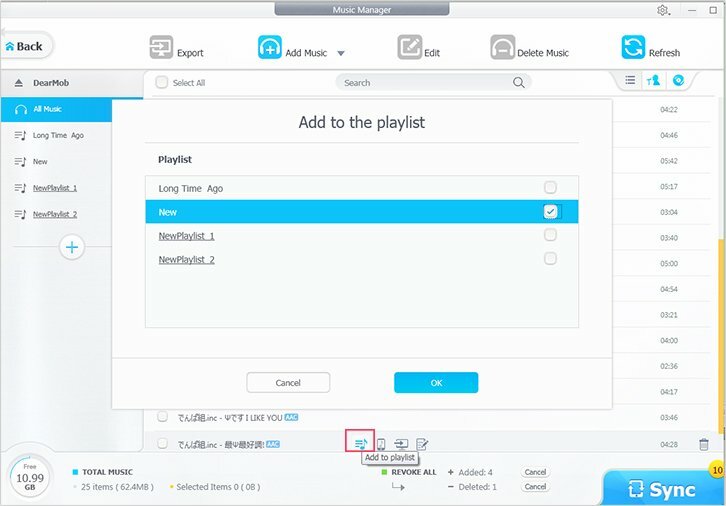 2 Hit "Sync" to transfer music to your iOS device. ● Tips 1: There is an Undo option provided for you in case you add some wrong music. Also, you can revoke all additions by click "Cancel". 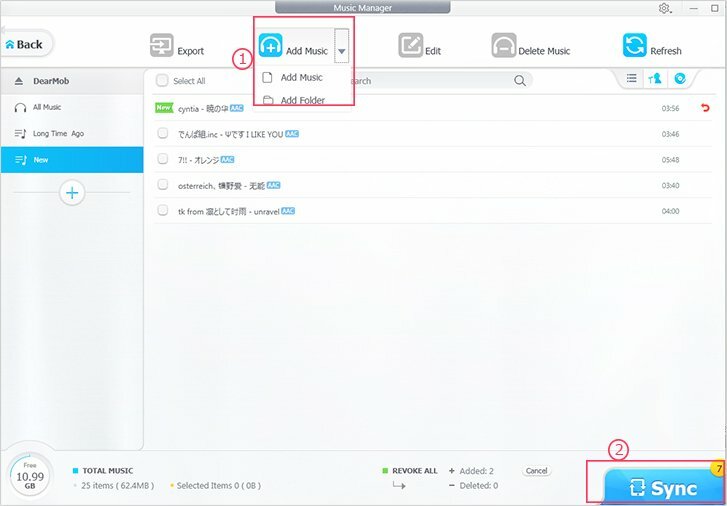 ● Tips 2: Music in formats like FLAC, OGG, WMA, WAV, can also be added to iOS device thanks to the auto music conversion feature. And it can compress the large audio file to suit your iPhone without quality loss. 1 Choose one music to edit info. 2 Click "Edit" icon to edit music information like: Title, Artist, Album, Composer, Year and Comment. 3 Hit "Sync" button to sync the changes to your iPhone iPad. 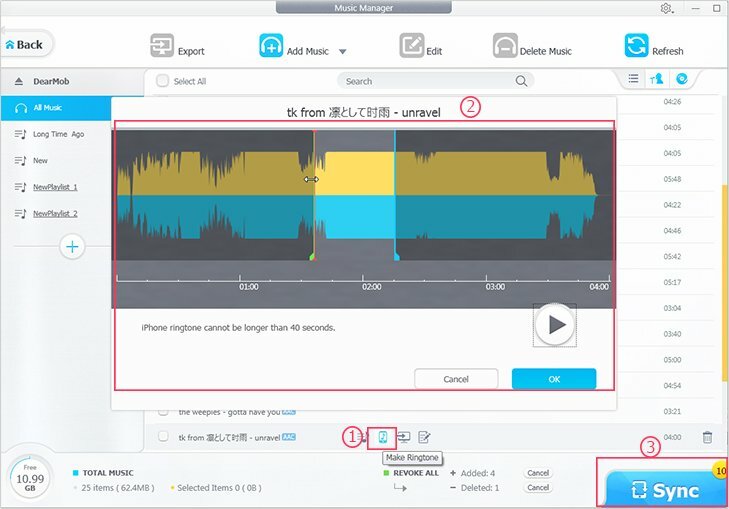 All the music can be deleted through DearMob iPhone Manager. 1 Choose the music that you want to delete. 3 Then choose "OK" to confirm deletion. 4 Hit "Sync" to synchronize the deletions with your iPhone iPad. ● Tips: You can click red curve icon beside music to Undo delete, or click "Cancel" to revoke all deletions. 1 Click "＋" icon to create a new playlist. Then you can import or move songs to this playlist. 2 Click the pen-shaped icon to modify the name of playlist. 3 Click "╳" icon to delete the playlist you added. Please Note: You need to click "Sync" button to transfer all the changes you made to your iPhone. ● Tips: You can select some music and click music note icon to add them to other playlist. With DearMob iPhone Manager, you can customize a ringtone within 40 seconds. 1 Click ringtone icon to trigger a wave form. 2 Drag the bright part of the form to choose which part to be used in ringtone. 3 Click "OK" and then "Sync" button to add the ringtone to your iPhone. ● Tips 1: You can find the ringtone on your iPhone in Settings > Sound > Ringtone. ● Tips 2: To manage your ringtone, please check Voice & Ringtone management. 1 Click "Video" icon on the main interface. Pick one, some or all videos. 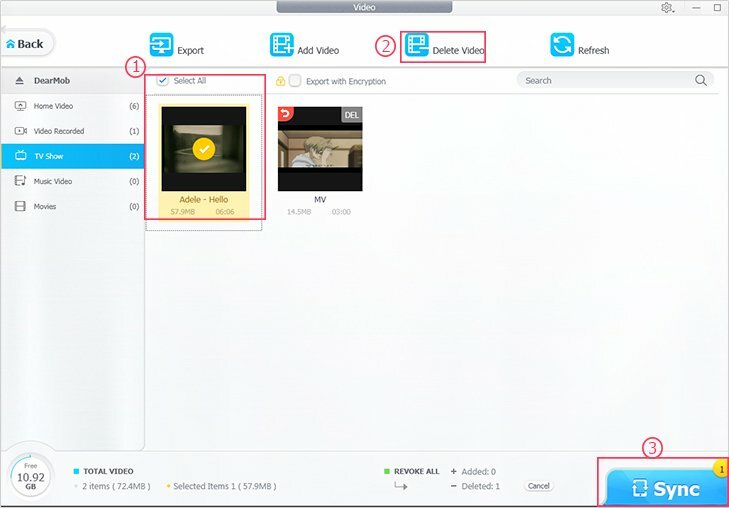 2 Click "Export" to transfer video from your iPhone iPad to Windows PC. 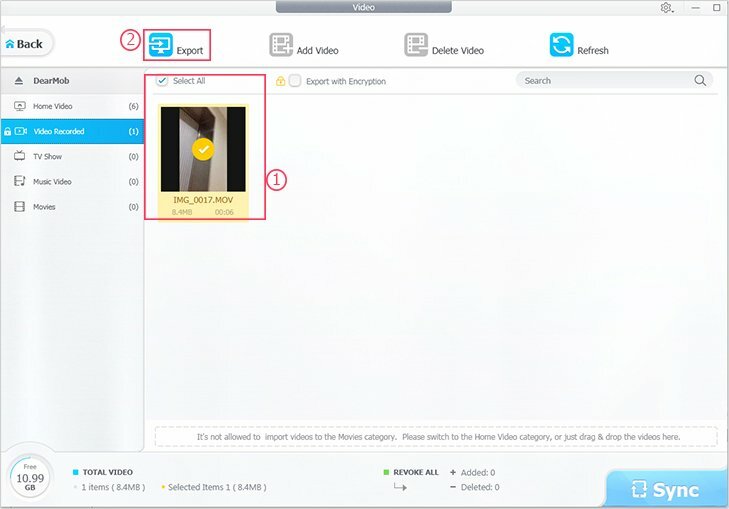 ● Tips 1: There is a search bar provided to search video on condition that you have many videos. 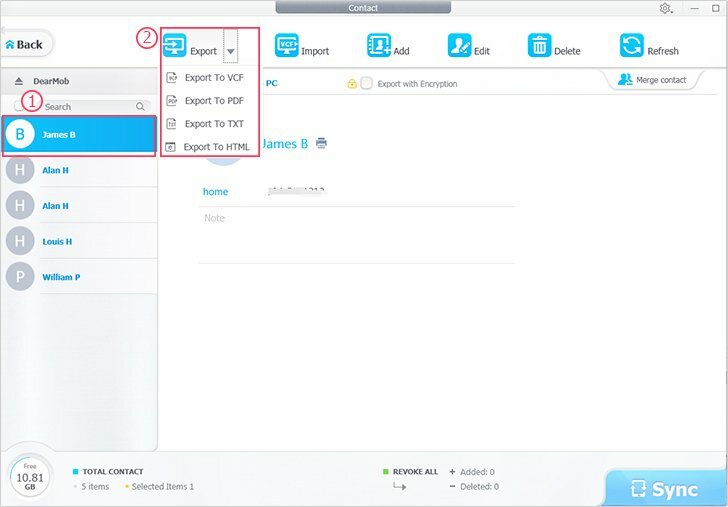 ● Tips 3: Tick "Export with Encryption", you can encrypt your videos while exporting. To decrypt the file, just check here. 1 Click "Add Video", and select the video you want to add to your iPhone iPad. ● Tips: If the video is not in MP4, MOV, M4V format, you can click "Convert" to convert the video to Apple-friendly MP4. And it can also compress 4K UHD videos to suit your iPhone iPad with no quality loss. 2 Hit "Sync" button to transfer videos to your iPhone iPad. ● Tips: You can click red curve icon beside music to Undo adding, or click "Cancel" to revoke all additions. Please Note: You cannot add video to the locked list. 1 Choose the video you want to delete. 2 And click "Delete Video". ● Tips: You can click red curve icon beside music to Undo deleting, or click "Cancel" to revoke all deletions. 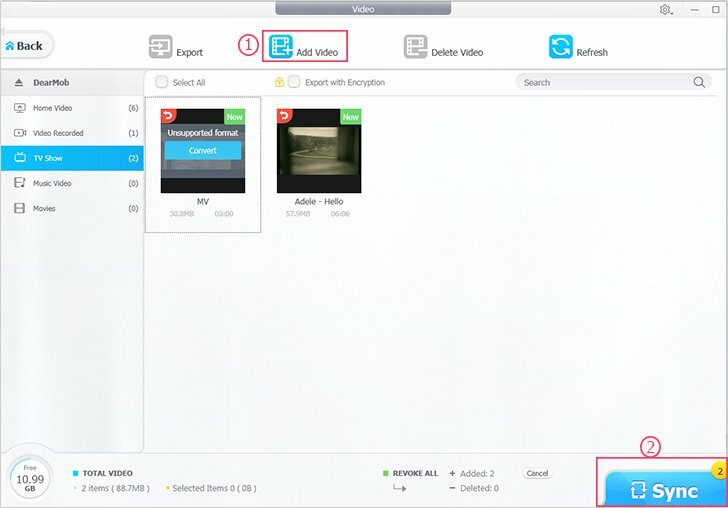 3 Click "Sync" to remove the video from your iPhone iPad. Please Note: You cannot delete video in locked list like "Video Recorded", "Movies". Move into "Backup your device" section, only one click is required. 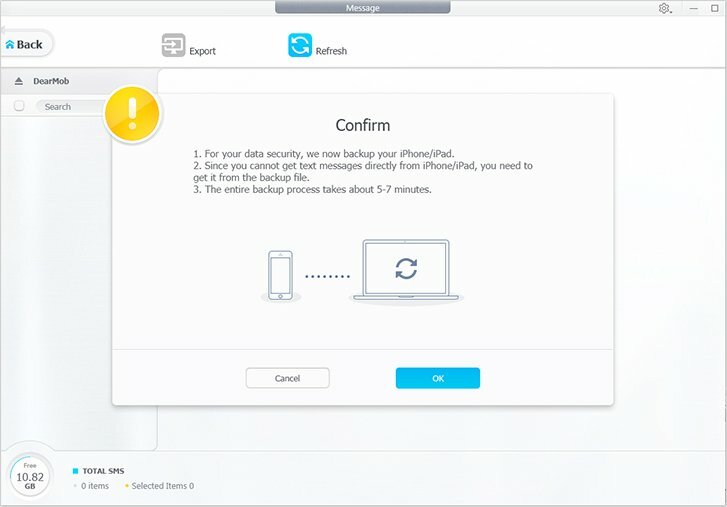 Click "Back Up Now", and wait a moment, your iOS data will all be backed up on computer. 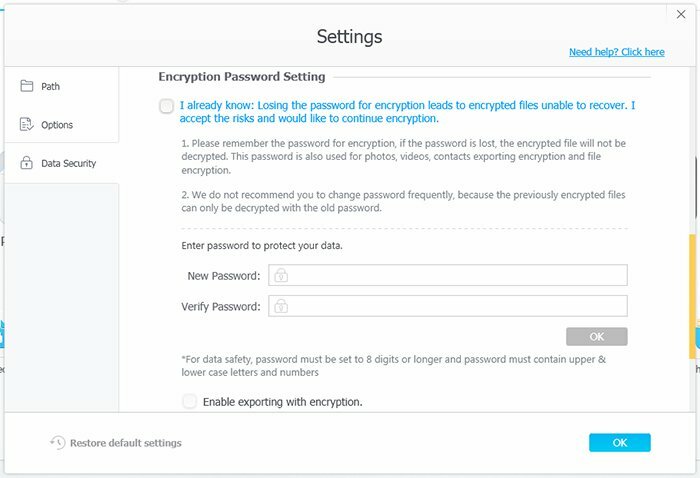 ● Tips 1: You are able to encrypt your backup data by ticking "Encrypt your backup". 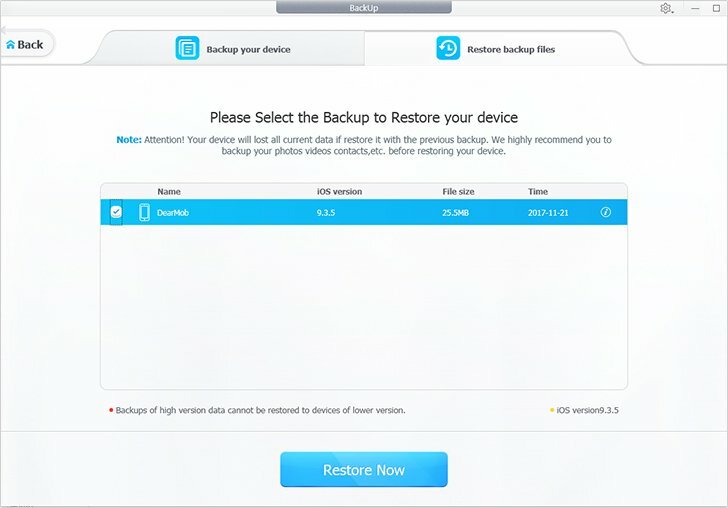 ● Tips 2: Find your backed up data in "Restore backup files". 1 Enter "Backup" from the main interface. Select "Restore backup files"
Please Note: The restoration will cover your current data on iPhone iPad, please make sure you would like to restore a copy of backup. 2 Choose the correct copy that you want to restore, then click "Restore Now". 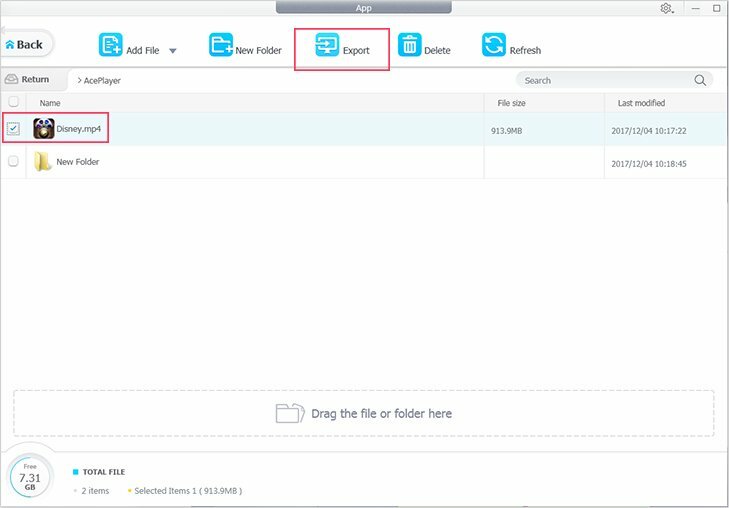 1 Enter File Management, select the App you want to export, and click "Export". 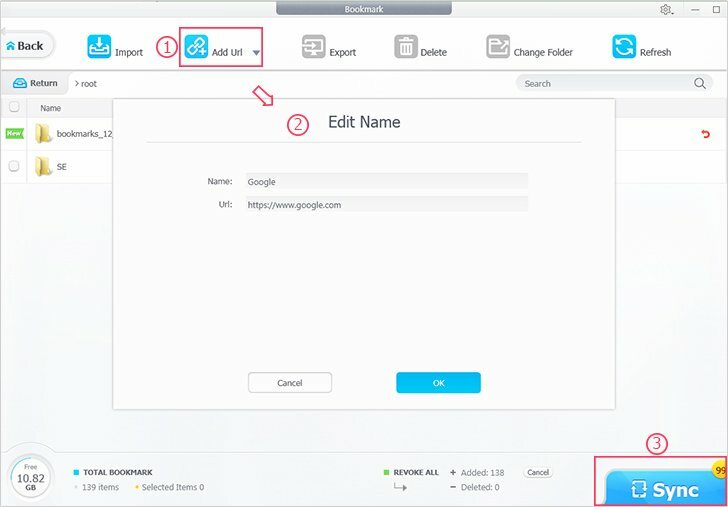 2 Click "Export" to transfer App files to computer. Please Note: Make sure your iDevice is iOS 11 and later and you installed above Apps on your iDevice. Double click one of the App in File Management, you can add any files to that App. 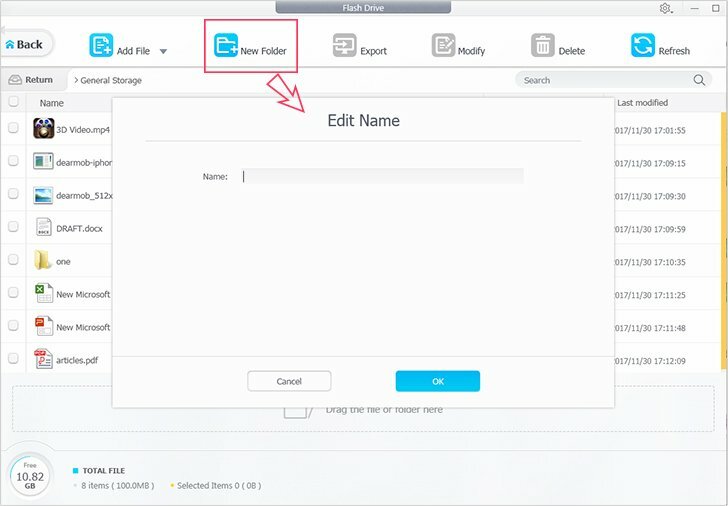 How to: Click "Add File" to import any files to the App. 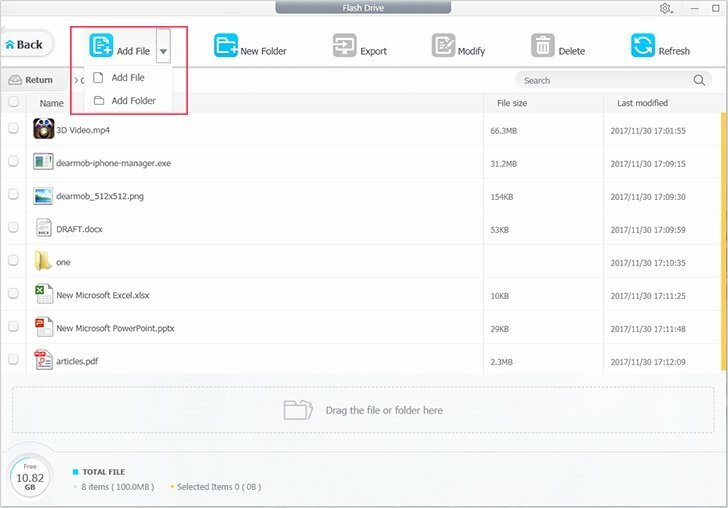 Or you can click "Add Folder" to import a folder of files in. Also, you are able to drag the file/folder to the empty place for adding. 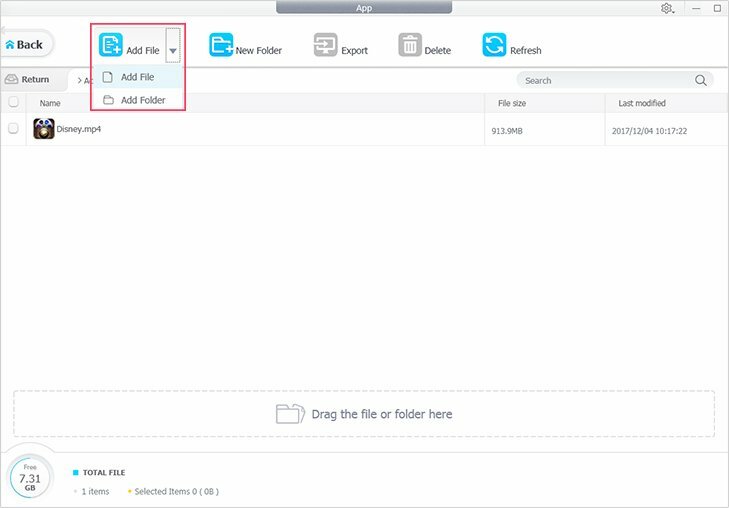 ● Tips: You can create a new folder by clicking "New Folder" in the App. 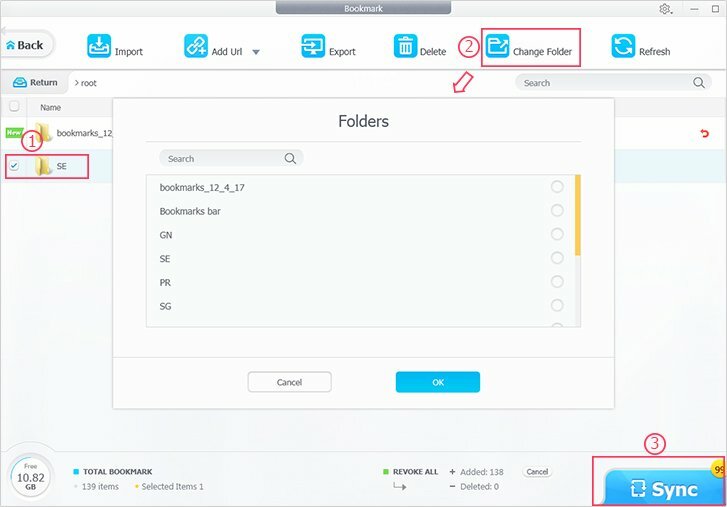 1 Double click the App you want to manage in File Management. 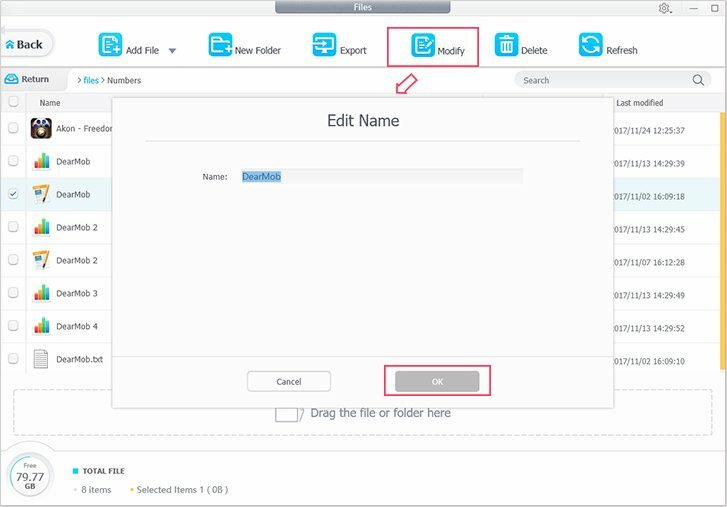 2 Pick one file, click "Edit" to modify the name of file. 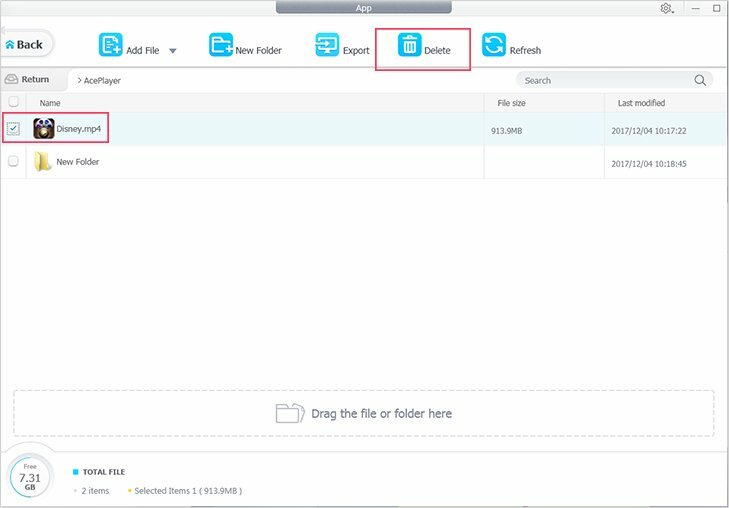 2 Select one file or some files, click "Delete" to remove the file from your iPhone iPad. 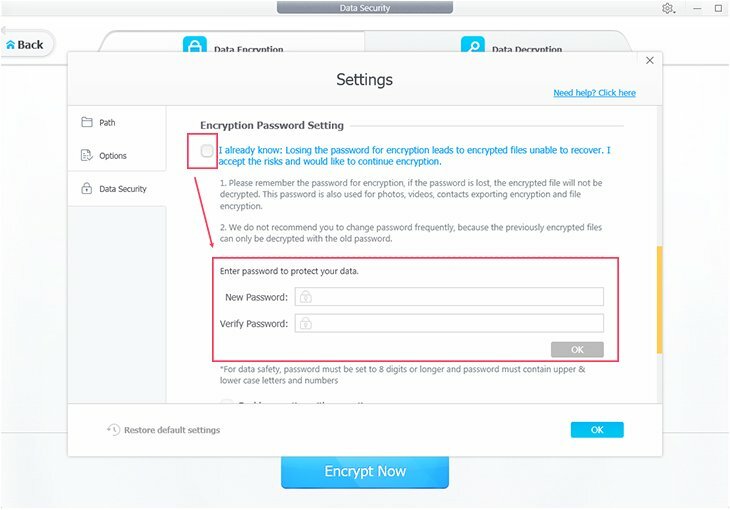 DearMob iPhone Manager allows you encrypt photos and videos with password in "Data Security" section. 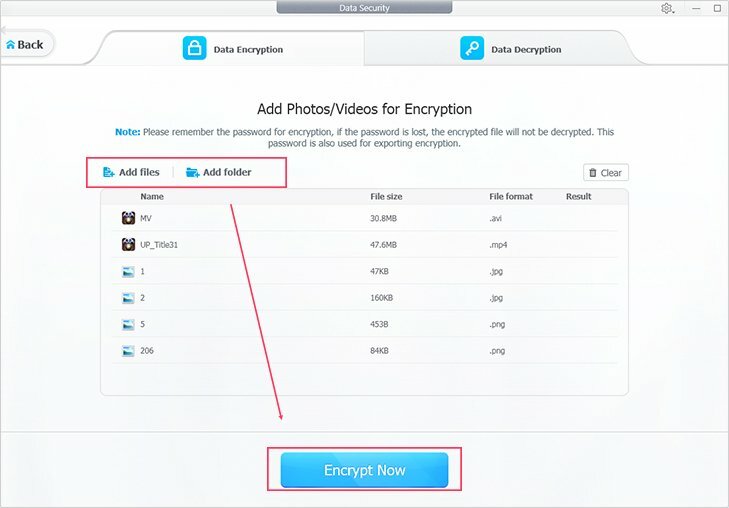 1 Choose "Add files" or "Add folder" to select the photo/video that you want to encrypt. 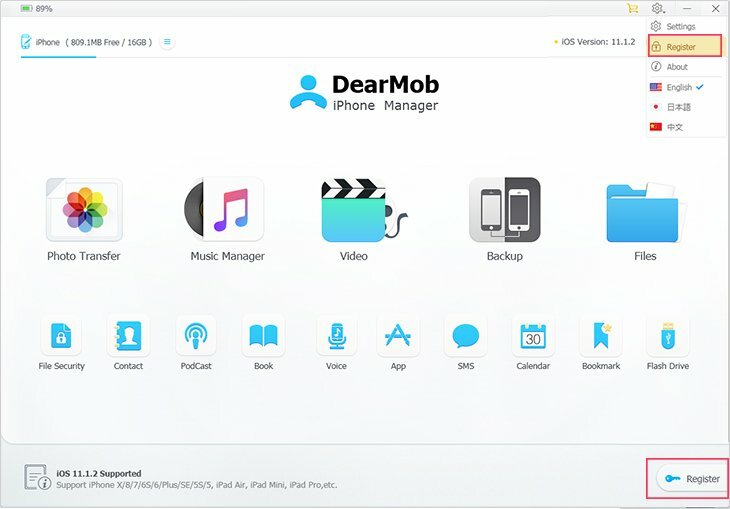 Please Note: DearMob iPhone Manager only recognize the files in current folder, files in subfolder cannot be recognized. Please select each folder for file encryption. 2 Click "Encrypt Now", a window will pop out to let you set the password, if you haven't set before. 3 Tick "I've already know...", then set the new password, click "OK". Please Note: The password should contains lowercase letter, uppercase letter and numbers. ●Tips: you can apply the same passwords to "Photo", "Video" and "Contact" encryption. 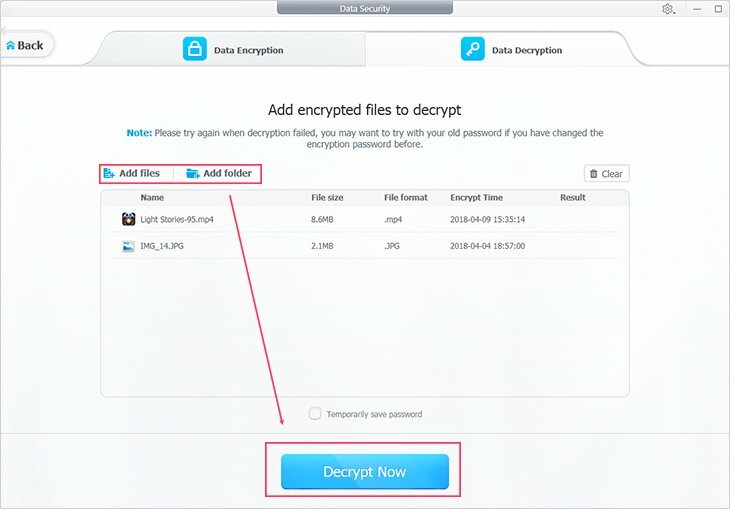 DearMob iPhone Manager can only decrypt the file that was encrypted by DearMob iPhone Manager itself. 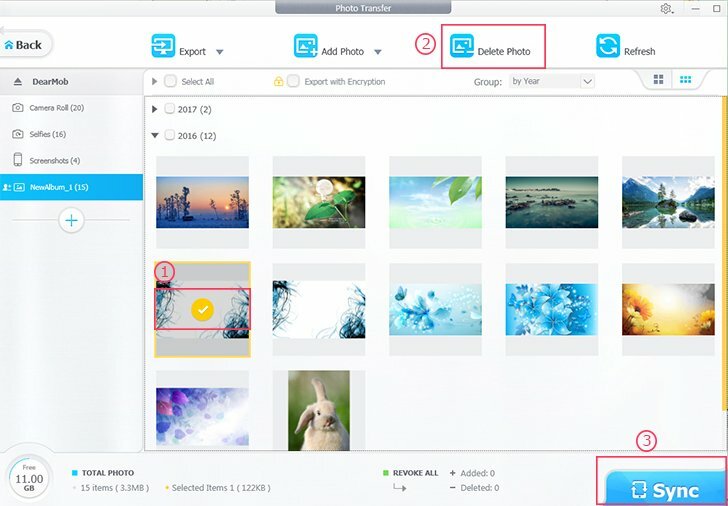 1 Choose "Add files" or "Add folder" to select the photo/video that you want to decrypt. 2 Click "Decrypt Now", a window will show up to let you input password. 2 Input the correct password, choose "OK". ● Tips: You can choose to save the password temporarily. It can remember the decode password before you close DearMob iPhone Manager. 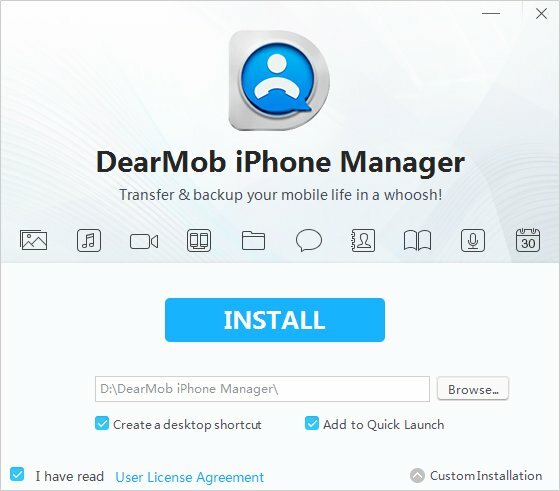 DearMob iPhone Manager allows users to export photo, video, contact with encryption. 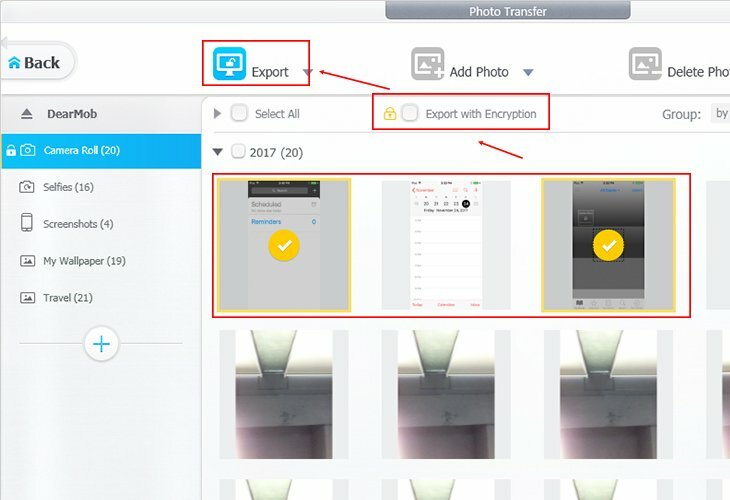 1 To export photo with encryption, go to Photo interface > select the photos you want to export with encryption > click "Export with Encryption" > "Export". Please Note: If you did not set password before, the setting window will pop up to let you set the password for encryption. 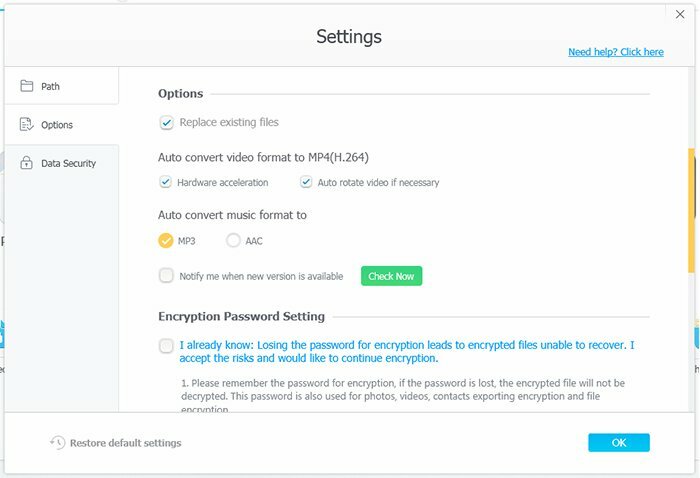 2 The steps to export video with encryption are the same as photo. 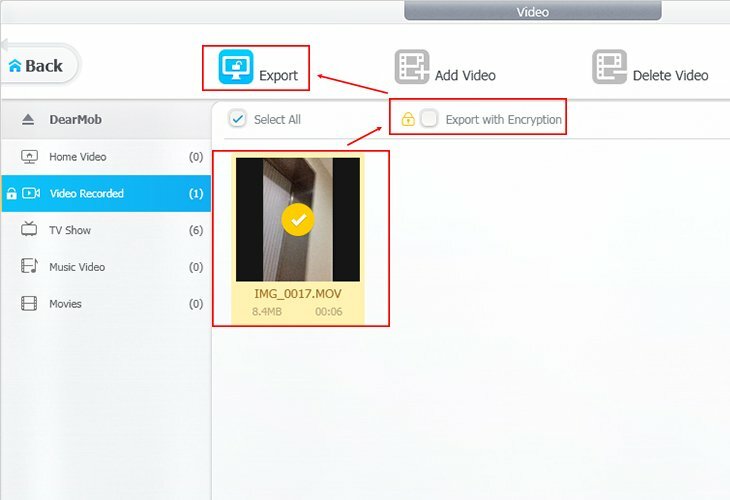 In Video interface > select the video you want to export with encryption > click "Export with Encryption" > "Export". 3 Also the same as contact. 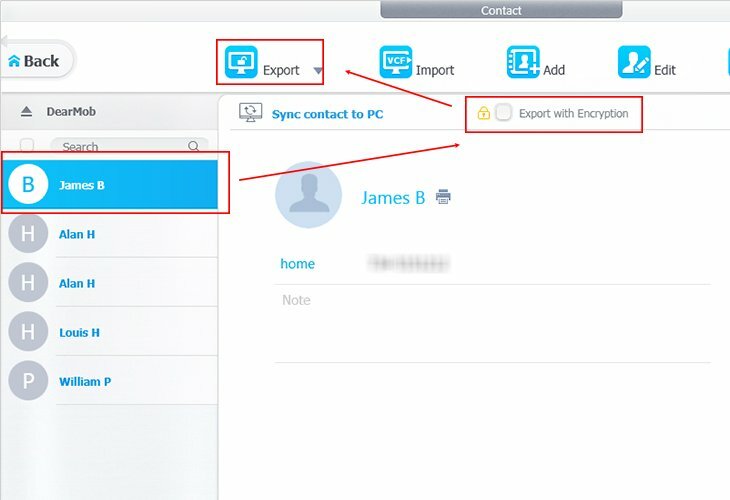 In Contact interface > select the contact info you want to export with encryption > click "Export with Encryption" > "Export". 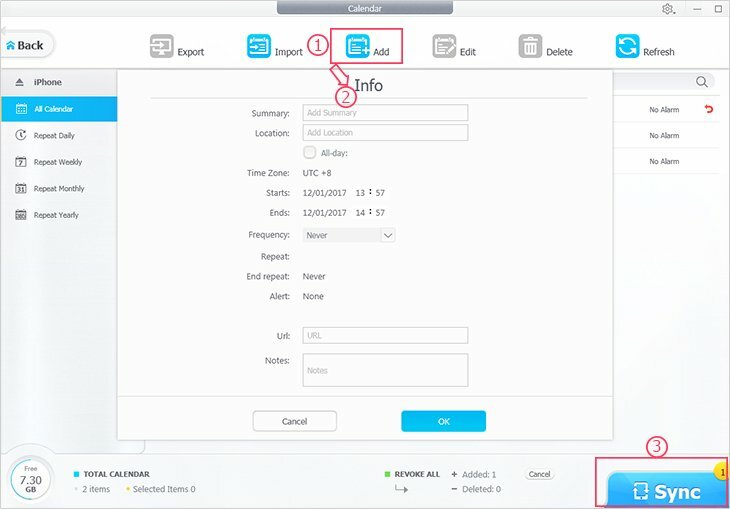 1 Choose the contact you want to export. 2 Click "Export" to download the contact to your local PC. You can choose to download it as VCF, PDF, TXT or HTML. ● Tips 1: Click "Refresh" to get real-time SMS of your iPhone. ● Tips 2: There is a search bar for you to search contact. ● Tips 3: Click "Print" icon you can also export contact to PDF for printing. ● Tips 4: If you want to protect your contacts with password, please choose "Export with Encryption". Find out how to decrypt files. 1 Click "Import" on the interface. 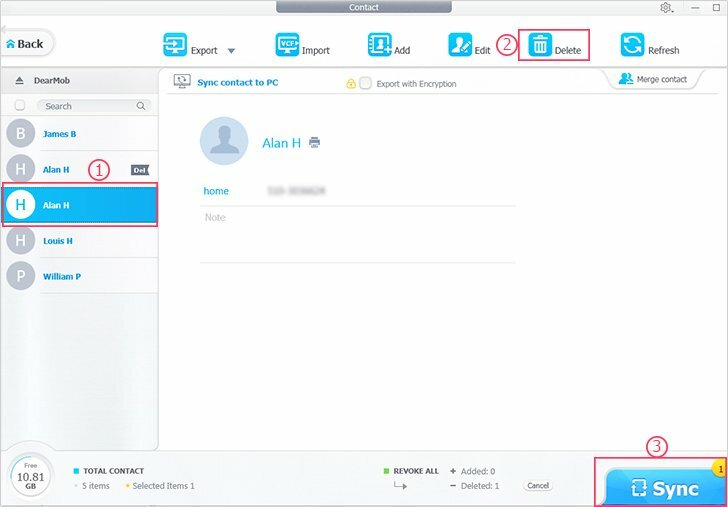 2 Find contact VCF file on your computer, and "Open". ● Tips: You can click "New" icon to undo importing or click "Cancel" to revoke all. 3 Hit"Sync" button to transfer added contacts to your iPhone. 1 Click "Add" to create a new contact. 2 Input information like: First Name, Last Name, Add Phone, etc. and "Save" it. ● Tips: You can click "New" icon to undo adding or click "Cancel" to revoke all. 3 Hit "Sync" button to transfer added contacts to your iPhone. 1 Select one contact, and click "Edit". 2 Edit the information like: First Name, Last Name, Company, Job Title, Department, Add Phone, Add Email, etc. and "Save" it. ● Tips: You can click "Edit" icon to undo editing. 3 Hit "Sync" button to transfer edited contact to your iPhone. 1 Select the contact that you want to delete, and click "Delete". ● Tips: You can click "Del" icon to undo deleting or click "Cancel" to revoke all. 3 Hit "Sync" button to synchronize the deletion to your iPhone. 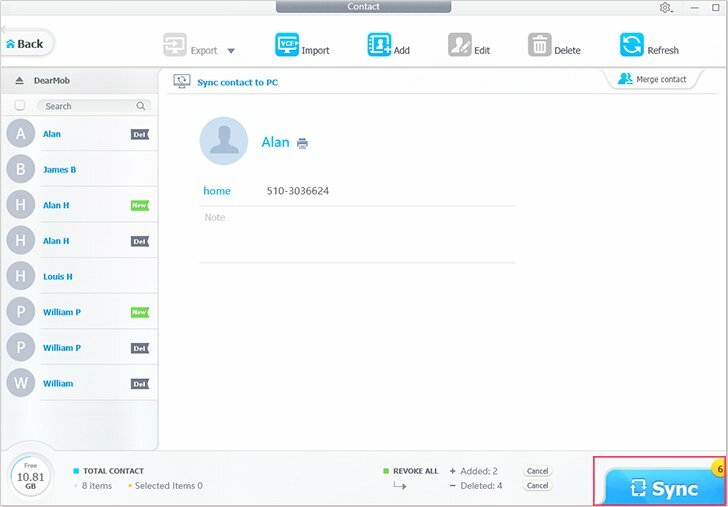 Sync to PC: synchronize the contacts to your Windows PC. 1 Click "Sync contact to PC", and click "OK", then it will be transferred to your Windows contact folder. 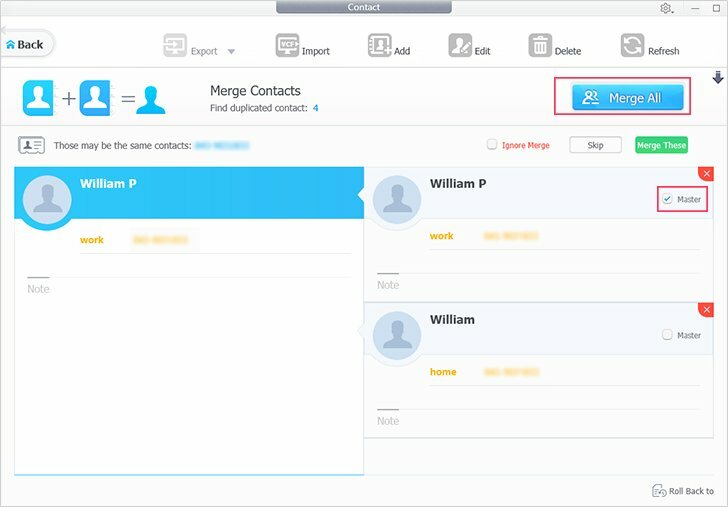 Merge contact: merge the same contacts to one. 2 Choose one contact as the main, ie. master contact. 3 Click "Merge All" to merge all the duplicated contacts. ● Tips 1: Click "Ignore" or "Skip" to skip merging this duplicated contacts. 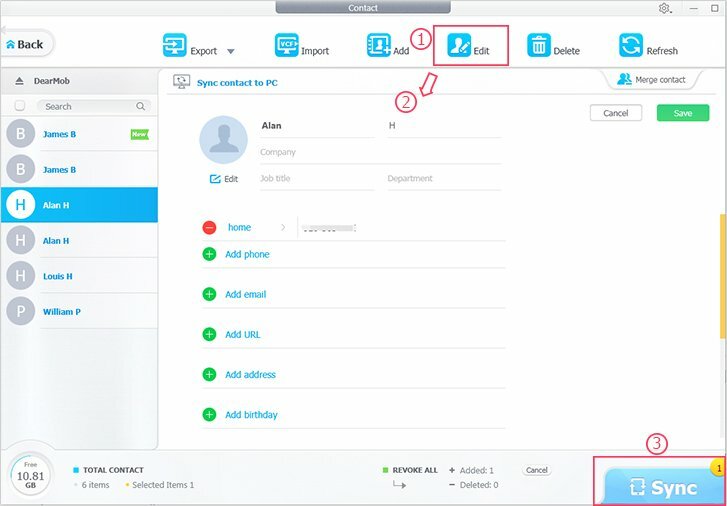 ● Tips 2: Click "Merge These" to merge current duplicated contacts. ● Tips 3: You can restore the merge by clicking "Roll back to". 4 Hit "Sync" button to transfer the changes to your iOS device. 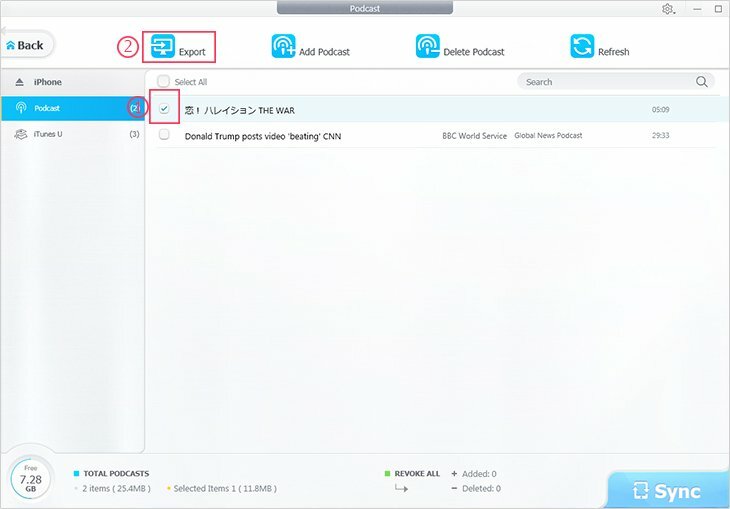 Export Podcast: Select the podcast, click "Export" to transfer to computer. ● Tips: You can "Refresh" to get real-time data of your iPhone iPad. 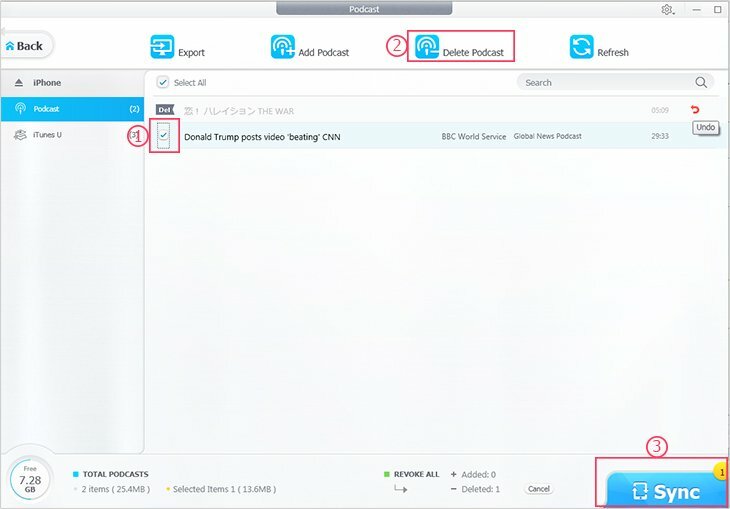 1 Click "Add Podcast", select files from your local computer, and "Open". ● Tips: You can click red curved icon to undo adding or click "Cancel" to revoke all additions. 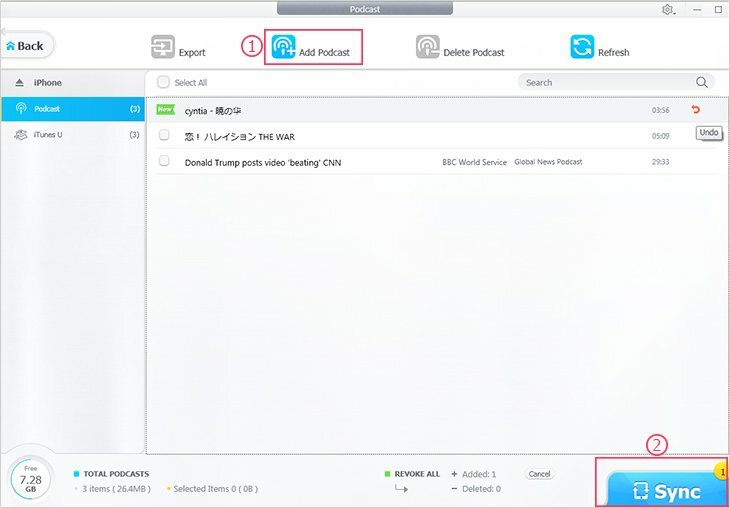 2 Hit "Sync" button to import podcast to your iPhone. 1 Tick the podcast, click "Delete Podcast". ● Tips: You can click red curved icon to undo deleting or click "Cancel" to revoke all deletions. 2 Hit "Sync" button to synchronize the changes to your iPhone. 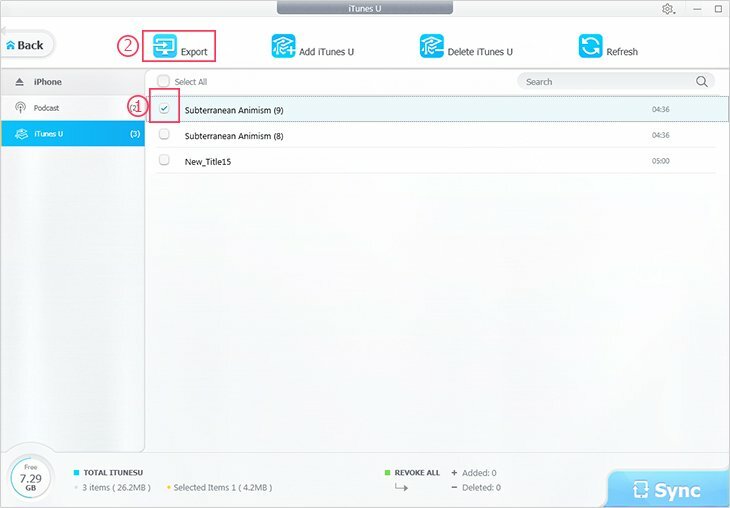 Export iTunes U: Select the iTunes U, and click "Export" to download to your local computer. ● Tips: Click "Refresh" to get real-time iTunes U from your iPhone. 1 Click "Add iTunes U", select files from your local computer, and "Open". 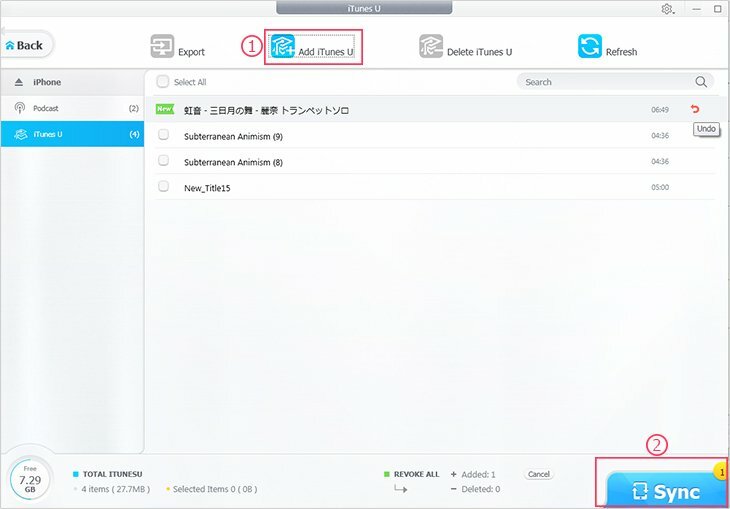 2 Hit "Sync" button to import iTunes U to your iPhone. 1 Choose the iTunes U you want to delete, and click "Delete iTunes U". 2 Hit "Sync" to synchronize the deletion to your iPhone. 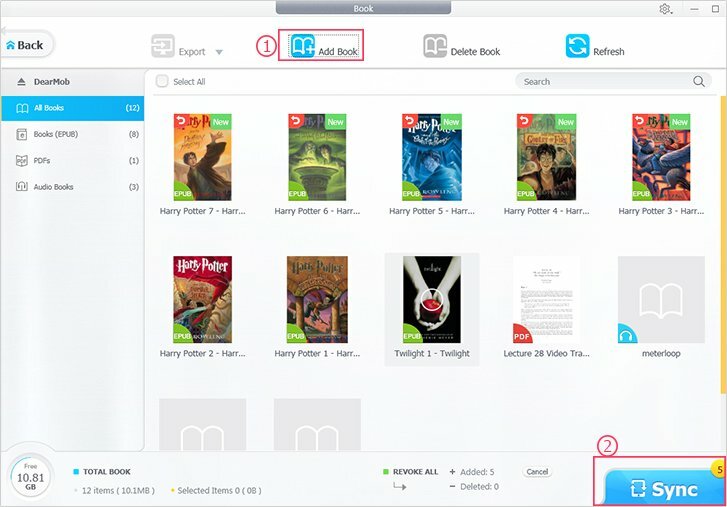 You can manage Epub, PDF, and audio books with DearMob iPhone Manager. 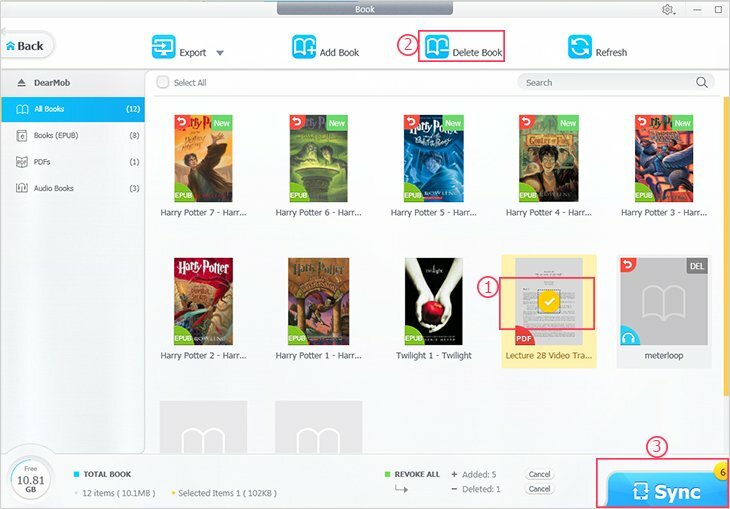 1 To export ebooks, choose one book or some books. 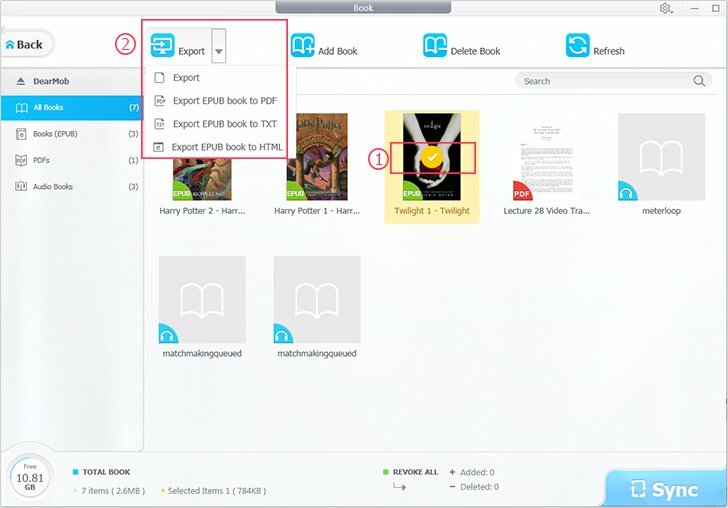 2 Click "Export" to transfer books from iPhone iPad to PC. ● Tips 1: Epub book can be exported (converted) as PDF, TXT and HTML. 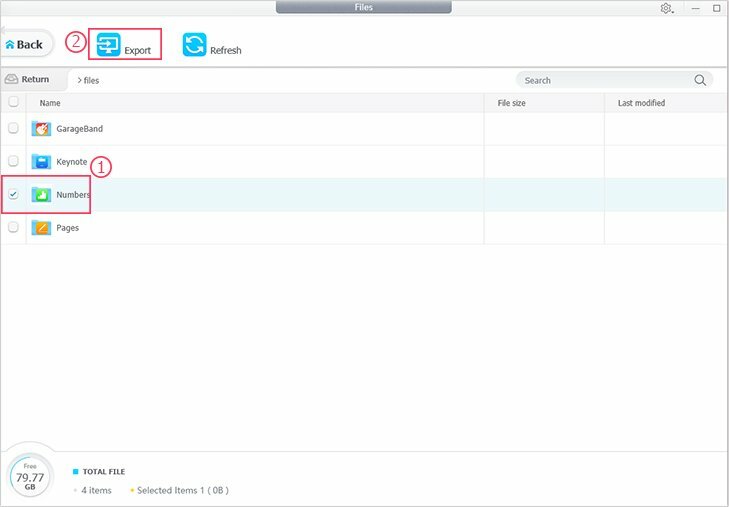 ● Tips 2: "Refresh" on DearMob iPhone Manager Book manage interface, you will get the real-time data from your iPhone. 1 Click "Add Book", you can choose Epub, PDF and audio books to "Open". 2 Hit "Sync" to import the book to your iPhone. 1 Select one book or some books, click "Delete Book". 2 Hit "Sync" button to synchronize the deletion to your iPhone. 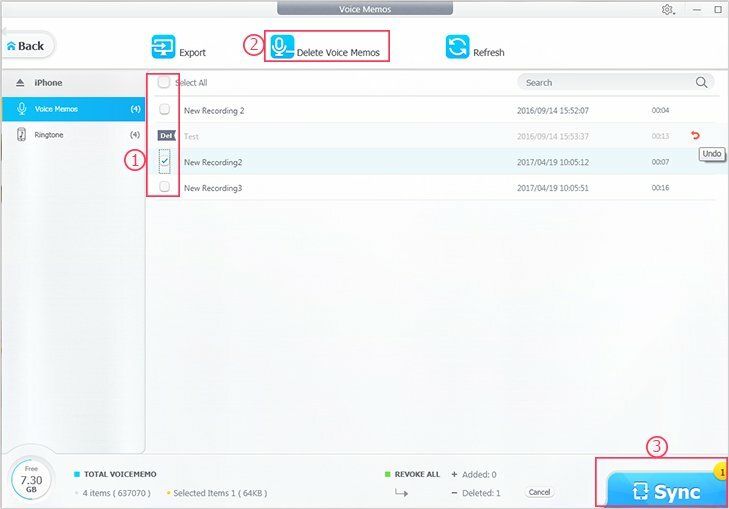 Export Voice Memos: Select the Voice Memos, and click "Export" to download to your local computer. ● Tips: Click "Refresh" to get real-time Voice Memos from your iPhone. 1 Choose the Voice Memos you want to delete, and click "Delete Voice Memos". 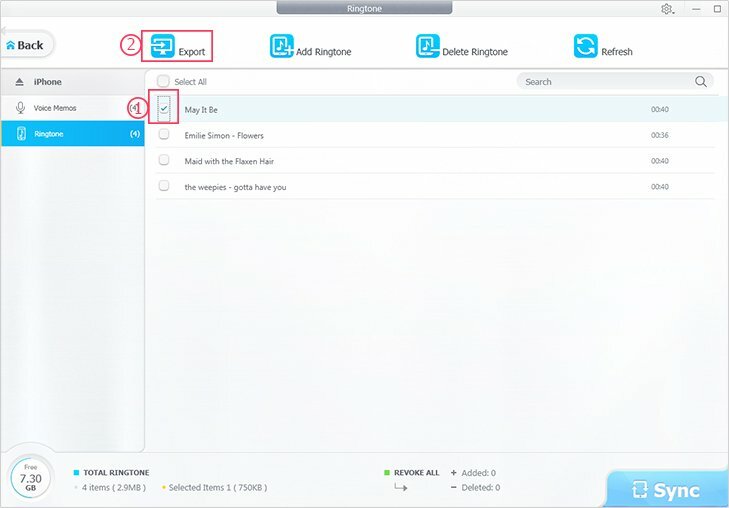 Export Ringtone: Select the ringtone, click "Export" to transfer to computer. 1 Click "Add Ringtone", select files from your local computer, and "Open". 2 Hit "Sync" button to import ringtone to your iPhone. ● Tips: To customize your own ringtone, please see Create Ringtone. 1 Tick the ringtone, click "Delete Ringtone". 1 Click "Install" on the interface. 2 Find an .ipa file on your local computer, and "Open". ● Tips: You can click red curved icon to undo installation or click "Cancel" to revoke all. 3 Hit "Sync" button to transfer the installation to your iPhone iPad. Please Note: Cracked App won't need an AppleID verification when use the App on your iDevice, while non-cracked App would require an AppleID verification. 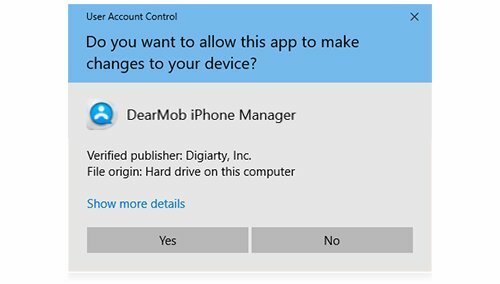 1 Select An App on DearMob iPhone Manager. ● Tips: You can click red curved icon to undo uninstallation or click "Cancel" to revoke all. 3 Hit "Sync" button to synchronize the uninstallation to your iPhone iPad. Please Note: Pre-installed Apps can't be uninstalled. 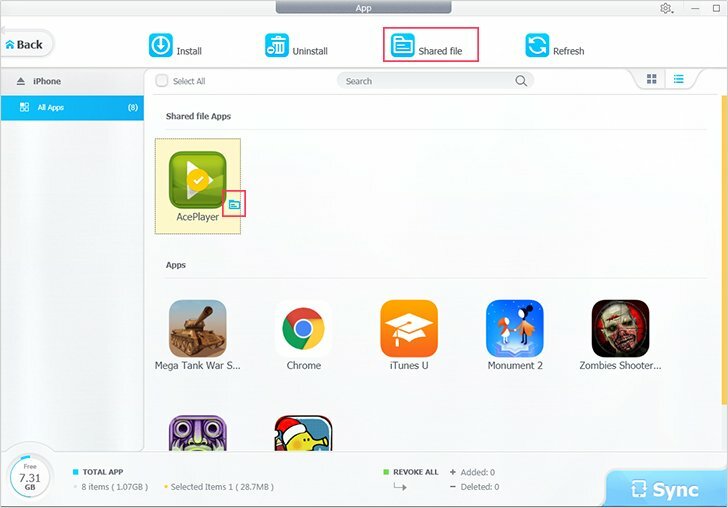 Select the App with a file icon beside. 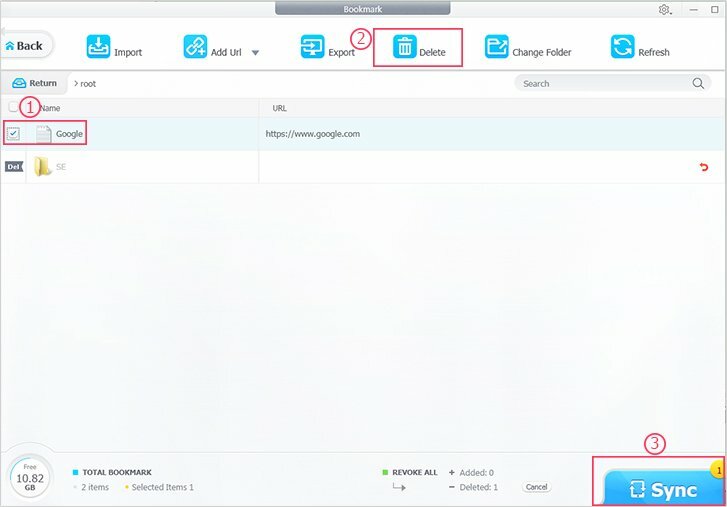 Click "Shared File" or the file icon to go into Shared File Management. ● Tips: Click "Refresh" to get real-time data of the Apps on your iPhone iPad. 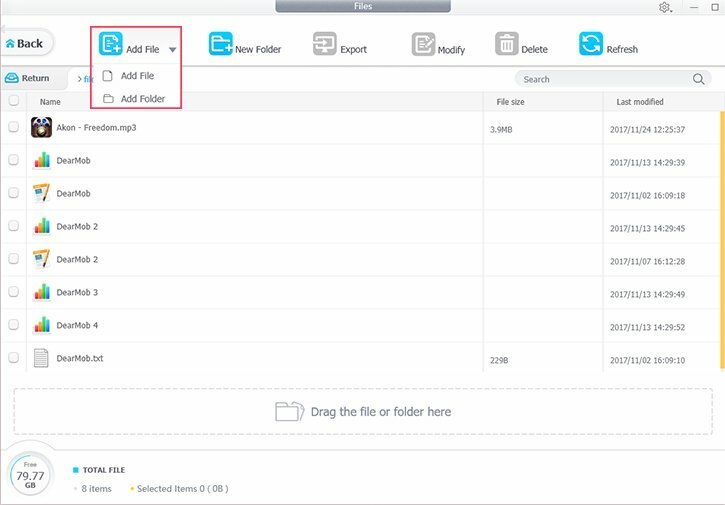 1 Add File: Click "Add File" to import any file into this App. 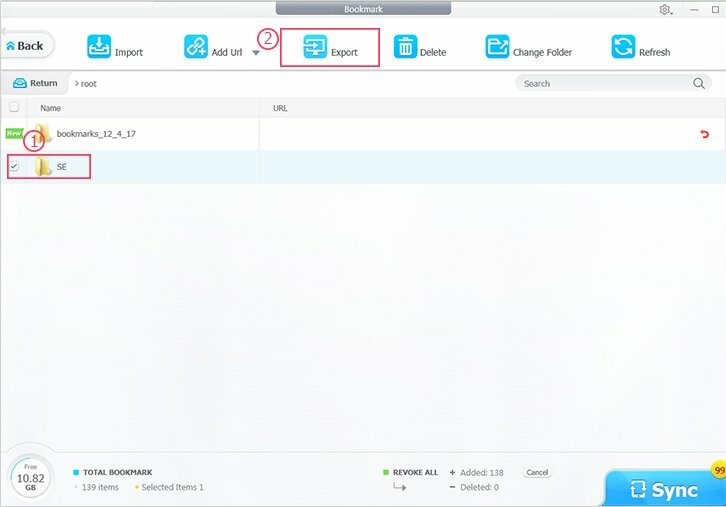 Or click "Add Folder" to import a folder of files. Or you can drag file/folder to the empty place for adding. 2 New Folder: Click "New Folder" to create a new folder in the App. 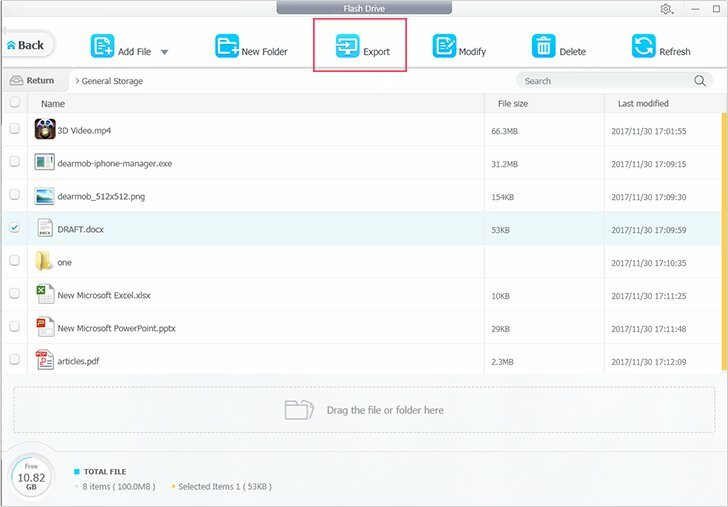 3 Export: Click "Export" to transfer App files to local computer. 4 Delete: Click "Delete" to erase the file of App. Please Note: For your data security, you'd better backup your iPhone first before manage SMS. 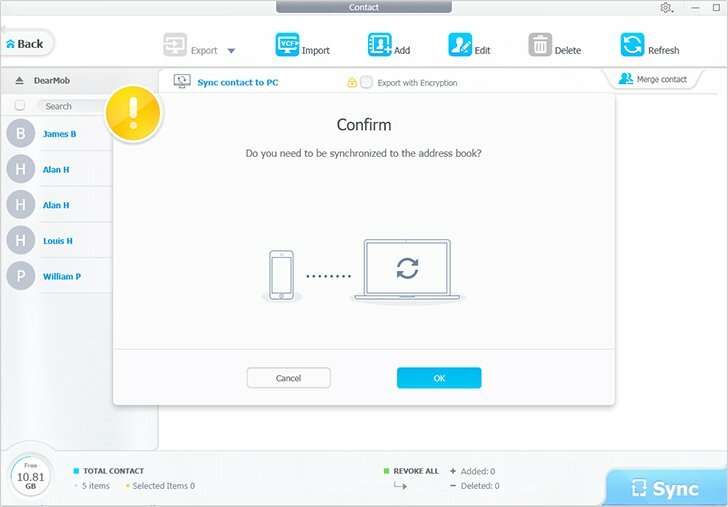 1 Select the SMS that you want to backup in your computer. 2 Click "Export" to download the SMS to your local PC. ● Tips: You can open the picture in your message, or even download it to your local computer. 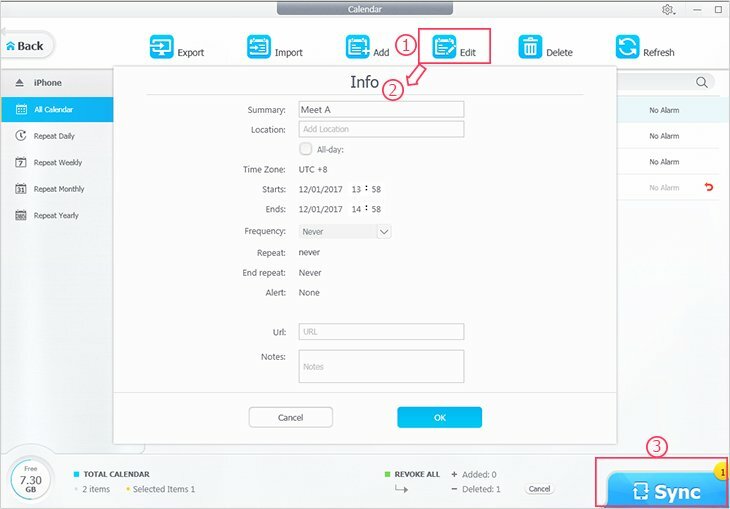 1 Choose the Calendar you want to export. Or you can choose calendar by group like: "All Calendar", "Repeat Daily", "Repeat Weekly", "Repeat Monthly", "Repeat Yearly". 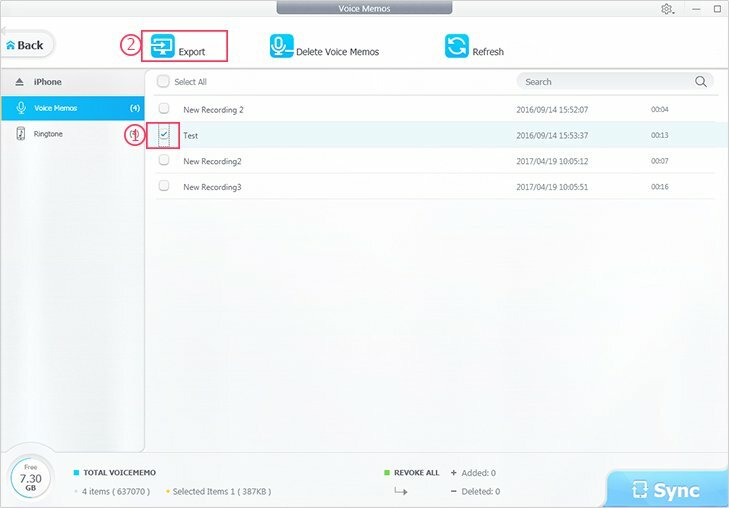 2 Click "Export", then it will be transferred from your iOS device to computer. ● Tips: Click "Refresh" to get real-time Calendar from your iPhone. 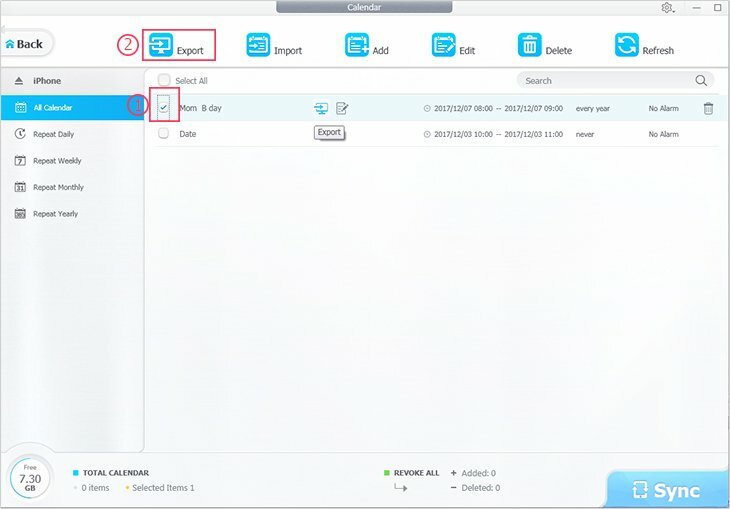 1 Click "Import" to find a Calendar file, and "Open". ● Tips: You can click red curved icon to undo adding or click "Cancel" to revoke all. 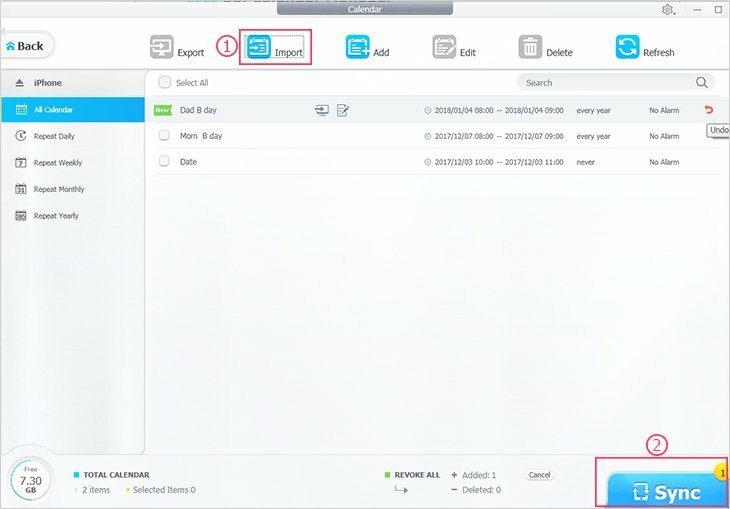 2 Hit "Sync" button to transfer Calendar from your computer to iDevice. 1 Click "Add" to create a new Calender on DearMob iPhone Manager. 2 Input Summery, Location, Alert Time, Repeat Type or URL and Note, then "OK". 3 Hit "Sync" button to transfer newly added Calendar to iDevice. 1 Click "Edit" you can modify Calendar info like: Summery, Location, Alert Time, Repeat Type, URL and Note. ● Tips: You can click red curved icon to undo editing. 2 Hit "Sync" button to transfer modified Calendar to iDevice. 1 Choose the Calendar you want to delete, and click "Delete". ● Tips: You can click red curved icon to undo deleting or click "Cancel" to revoke all. 2 Hit "Sync" button to synchronize the deletion to your iDevice. 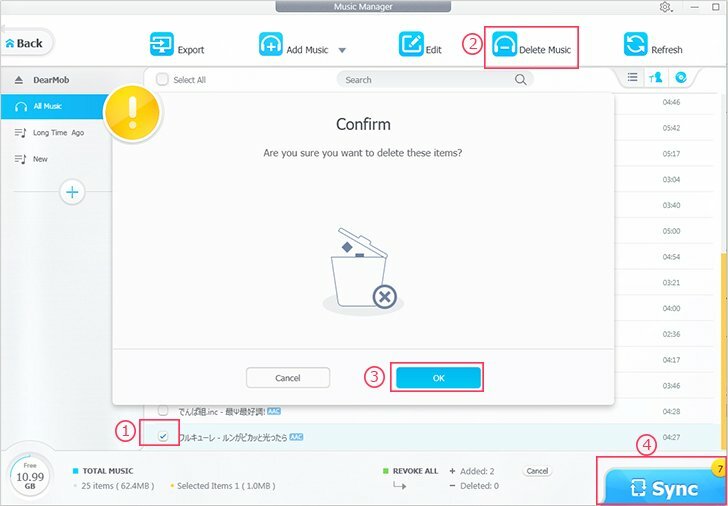 2 Choose .htm or .html files on computer and click "Open". ● Tips: You can click red curved icon to undo importing or click "Cancel" to revoke all. 3 Hit "Sync" button to import the bookmark to your iPhone iPad. 1 Click "Add URL" to create new bookmark. 2 Input bookmark Name & URL, then click "OK". ● Tips 1: You can click red curved icon to undo adding or click "Cancel" to revoke all. 3 Hit "Sync" button to transfer the new bookmark to your iPhone iPad. 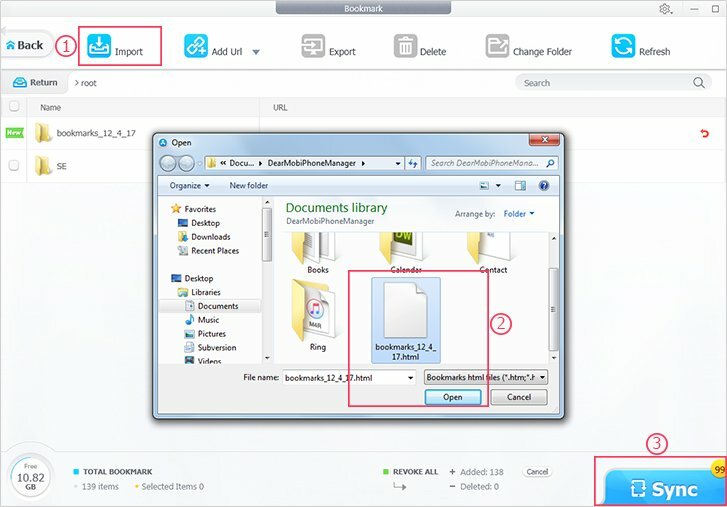 ● Tips 2: Or you can click "Add Folder" to create new folder to put bookmark. 1 Pick the bookmark that you want to backup to computer. 2 Click "Export" to transfer the bookmark to your local PC. Or you can click the small export icon beside each bookmark or folder. ● Tips: Click "Refresh" to get real-time data of the Bookmark of your iPhone iPad. 1 Choose one bookmark, and click the small edit icon beside it. 2 Then you can edit the Name and URL of the bookmark. 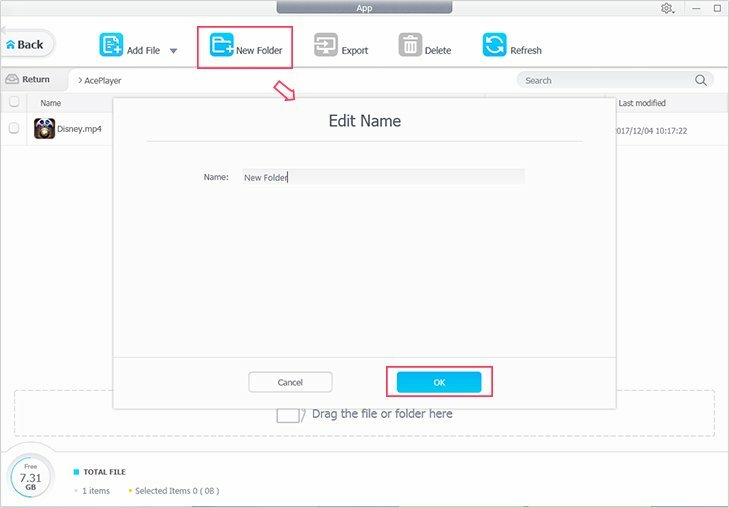 ● Tips 1: You are able to edit folder name too with the same steps. ● Tips 2: You can click red curved icon to undo editing. 3 Hit "Sync" button to synchronize the changes to your iPhone iPad. 1 Choose the bookmark or folder that you want to delete. 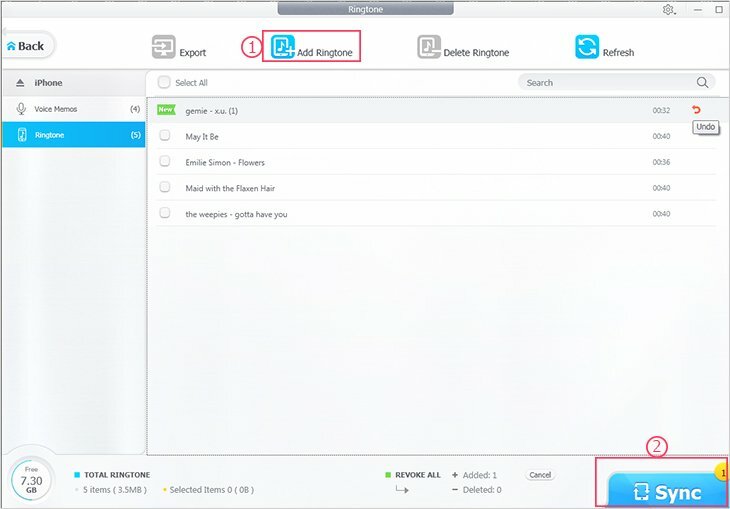 3 Hit "Sync" button to synchronize the deletion to your iPhone iPad. 1 Pick one bookmark or folder, and click "Change Folder". Or you can click the small link icon beside each file. 2 Tick or unpick the list to change folder. ● Tips 1: You can click red curved icon to undo changes or click "Cancel" to revoke all. Add File: To turn your iPhone as a USB Flash Drive, you can add any kind of file into it. Below are the two method to add files. 1 Click "Add File", to select files from your local computer, and "Open". Or you can click "Add Folder" to choose a folder to add. 2 Drag the file or folder to the empty place to add. 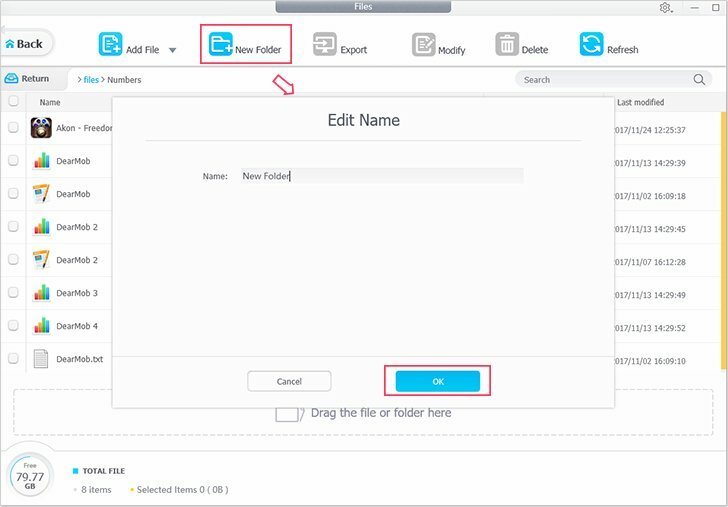 New Folder: It is possible to create new folders by clicking "New Folder". Name it and click "OK". 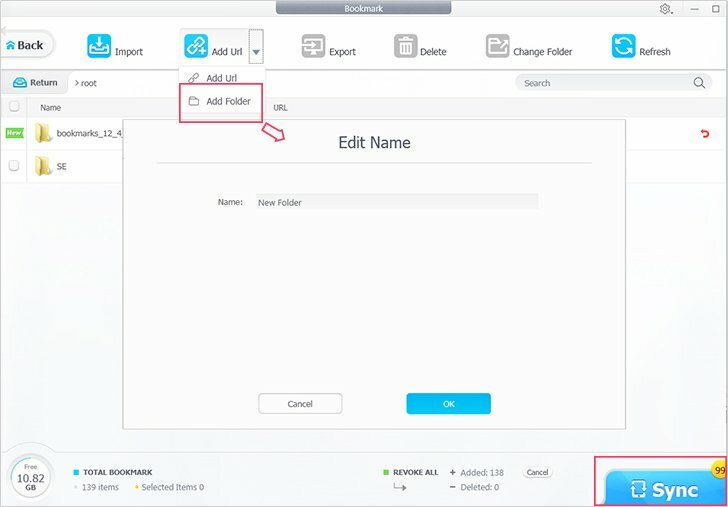 1 Choose the file or files that you want to export to local computer. 2 Click "Export", that's all. Modify File: Click "Modify" to change the name of the file. Delete File: Pick the file you want to delete, click "Delete icon" and then "OK".